For the magazine, see Phonograph Record (magazine). Video of a 1936 spring-motor-driven 78 rpm acoustic (non-electronic) gramophone playing a shellac record. A phonograph record (also known as a gramophone record, especially in British English, or record) is an analog sound storage medium in the form of a flat disc with an inscribed, modulated spiral groove. The groove usually starts near the periphery and ends near the center of the disc. At first, the discs were commonly made from shellac; starting in the 1950s polyvinyl chloride became common. In recent decades, records have sometimes been called vinyl records, or simply vinyl. The phonograph disc record was the primary medium used for music reproduction throughout the 20th century. It had co-existed with the phonograph cylinder from the late 1880s and had effectively superseded it by around 1912. Records retained the largest market share even when new formats such as the compact cassette were mass-marketed. By the 1980s, digital media, in the form of the compact disc, had gained a larger market share, and the vinyl record left the mainstream in 1991. Since the 1990s, records continue to be manufactured and sold on a smaller scale, and are especially used by disc jockeys (DJs) and released by artists in mostly dance music genres, and listened to by a growing niche market of audiophiles. The phonograph record has made a notable niche resurgence in the early 21st century – 9.2 million records were sold in the U.S. in 2014, a 260% increase since 2009. Likewise, in the UK sales have increased five-fold from 2009 to 2014. As of 2017, 48 record pressing facilities remain worldwide, 18 in the United States and 30 in other countries. The increased popularity of vinyl has led to the investment in new and modern record-pressing machines. Only two producers of lacquers (acetate discs) remain: Apollo Masters in California, and MDC in Japan. Phonograph records are generally described by their diameter in inches (12-inch, 10-inch, 7-inch), the rotational speed in revolutions per minute (rpm) at which they are played (​8 1⁄3, ​16 2⁄3, ​33 1⁄3, 45, 78), and their time capacity, determined by their diameter and speed (LP [long playing], 12-inch disc, ​33 1⁄3 rpm; SP [single], 10-inch disc, 78 rpm, or 7-inch disc, 45 rpm; EP [extended play], 12-inch disc or 7-inch disc, ​33 1⁄3 or 45 rpm); their reproductive quality, or level of fidelity (high-fidelity, orthophonic, full-range, etc. ); and the number of audio channels (mono, stereo, quad, etc.). Vinyl records may be scratched or warped if stored incorrectly but if they are not exposed to high heat, carelessly handled or broken, a vinyl record has the potential to last for centuries. The large cover (and inner sleeves) are valued by collectors and artists for the space given for visual expression, especially when it comes to the long play vinyl LP. The phonautograph, patented by Léon Scott in 1857, used a vibrating diaphragm and stylus to graphically record sound waves as tracings on sheets of paper, purely for visual analysis and without any intent of playing them back. In the 2000s, these tracings were first scanned by audio engineers and digitally converted into audible sound. Phonautograms of singing and speech made by Scott in 1860 were played back as sound for the first time in 2008. Along with a tuning fork tone and unintelligible snippets recorded as early as 1857, these are the earliest known recordings of sound. In 1877, Thomas Edison invented the phonograph. Unlike the phonautograph, it could both record and reproduce sound. Despite the similarity of name, there is no documentary evidence that Edison's phonograph was based on Scott's phonautograph. Edison first tried recording sound on a wax-impregnated paper tape, with the idea of creating a "telephone repeater" analogous to the telegraph repeater he had been working on. Although the visible results made him confident that sound could be physically recorded and reproduced, his notes do not indicate that he actually reproduced sound before his first experiment in which he used tinfoil as a recording medium several months later. The tinfoil was wrapped around a grooved metal cylinder and a sound-vibrated stylus indented the tinfoil while the cylinder was rotated. The recording could be played back immediately. The Scientific American article that introduced the tinfoil phonograph to the public mentioned Marey, Rosapelly and Barlow as well as Scott as creators of devices for recording but, importantly, not reproducing sound. Edison also invented variations of the phonograph that used tape and disc formats. [not in citation given] Numerous applications for the phonograph were envisioned, but although it enjoyed a brief vogue as a startling novelty at public demonstrations, the tinfoil phonograph proved too crude to be put to any practical use. A decade later, Edison developed a greatly improved phonograph that used a hollow wax cylinder instead of a foil sheet. This proved to be both a better-sounding and far more useful and durable device. The wax phonograph cylinder created the recorded sound market at the end of the 1880s and dominated it through the early years of the 20th century. 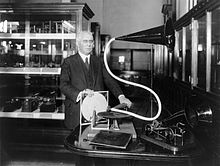 Lateral-cut disc records were developed in the United States by Emile Berliner, who named his system the "gramophone", distinguishing it from Edison's wax cylinder "phonograph" and American Graphophone's wax cylinder "graphophone". Berliner's earliest discs, first marketed in 1889, only in Europe, were 12.5 cm (approx 5 inches) in diameter, and were played with a small hand-propelled machine. Both the records and the machine were adequate only for use as a toy or curiosity, due to the limited sound quality. In the United States in 1894, under the Berliner Gramophone trademark, Berliner started marketing records of 7 inches diameter with somewhat more substantial entertainment value, along with somewhat more substantial gramophones to play them. Berliner's records had poor sound quality compared to wax cylinders, but his manufacturing associate Eldridge R. Johnson eventually improved it. Abandoning Berliner's "Gramophone" trademark for legal reasons, in 1901 Johnson's and Berliner's separate companies reorganized to form the Victor Talking Machine Company in Camden, New Jersey, whose products would come to dominate the market for many years. Emile Berliner moved his company to Montreal in 1900. The factory, which became the Canadian branch of RCA Victor still exists. There is a dedicated museum in Montreal for Berliner (Musée des ondes Emile Berliner). In 1901, 10-inch disc records were introduced, followed in 1903 by 12-inch records. These could play for more than three and four minutes, respectively, whereas contemporary cylinders could only play for about two minutes. In an attempt to head off the disc advantage, Edison introduced the Amberol cylinder in 1909, with a maximum playing time of ​4 1⁄2 minutes (at 160 rpm), which in turn were superseded by Blue Amberol Records, which had a playing surface made of celluloid, a plastic, which was far less fragile. Despite these improvements, during the 1910s discs decisively won this early format war, although Edison continued to produce new Blue Amberol cylinders for an ever-dwindling customer base until late in 1929. By 1919, the basic patents for the manufacture of lateral-cut disc records had expired, opening the field for countless companies to produce them. Analog disc records dominated the home entertainment market until they were outsold by digital compact discs in the 1980s, which were in turn supplanted by digital audio recordings distributed via online music stores and Internet file sharing. Early disc recordings were produced in a variety of speeds ranging from 60 to 130 rpm, and a variety of sizes. As early as 1894, Emile Berliner's United States Gramophone Company was selling single-sided 7-inch discs with an advertised standard speed of "about 70 rpm". The speed regulator was furnished with an indicator that showed the speed when the machine was running so that the records, on reproduction, could be revolved at exactly the same speed...The literature does not disclose why 78 rpm was chosen for the phonograph industry, apparently this just happened to be the speed created by one of the early machines and, for no other reason continued to be used. By 1925, the speed of the record was becoming standardized at a nominal value of 78 rpm. However, the standard differed between places with alternating current electricity supply at 60 hertz (cycles per second, Hz) and those at 50 Hz. Where the mains supply was 60 Hz, the actual speed was 78.26 rpm: that of a 60 Hz stroboscope illuminating 92-bar calibration markings. Where it was 50 Hz, it was 77.92 rpm: that of a 50 Hz stroboscope illuminating 77-bar calibration markings. Early recordings were made entirely acoustically, the sound being collected by a horn and piped to a diaphragm, which vibrated the cutting stylus. Sensitivity and frequency range were poor, and frequency response was very irregular, giving acoustic recordings an instantly recognizable tonal quality. A singer practically had to put his or her face in the recording horn. Lower-pitched orchestral instruments such as cellos and double basses were often doubled (or replaced) by louder instruments, such as tubas. Standard violins in orchestral ensembles were commonly replaced by Stroh violins, which became popular with recording studios. Even drums, if planned and placed properly, could be effectively recorded and heard on even the earliest jazz and military band recordings. The loudest instruments such as the drums and trumpets were positioned the farthest away from the collecting horn. Lillian Hardin Armstrong, a member of King Oliver's Creole Jazz Band, which recorded at Gennett Records in 1923, remembered that at first Oliver and his young second trumpet, Louis Armstrong, stood next to each other and Oliver's horn could not be heard. "They put Louis about fifteen feet over in the corner, looking all sad." During the first half of the 1920s, engineers at Western Electric, as well as independent inventors such as Orlando Marsh, developed technology for capturing sound with a microphone, amplifying it with vacuum tubes, then using the amplified signal to drive an electromechanical recording head. Western Electric's innovations resulted in a broader and smoother frequency response, which produced a dramatically fuller, clearer and more natural-sounding recording. Soft or distant sounds that were previously impossible to record could now be captured. Volume was now limited only by the groove spacing on the record and the amplification of the playback device. Victor and Columbia licensed the new electrical system from Western Electric and began issuing discs during the Spring of 1925. The first electrically made classical recording was Chopin's "Impromptus" and Schubert's "Litanei" performed by Alfred Cortot for Victor. ... the time has come for serious musical criticism to take account of performances of great music reproduced by means of the records. To claim that the records have succeeded in exact and complete reproduction of all details of symphonic or operatic performances ... would be extravagant ... [but] the article of today is so far in advance of the old machines as hardly to admit classification under the same name. Electrical recording and reproduction have combined to retain vitality and color in recitals by proxy. A 10-inch Decelith blank for making an individually cut one-off recording. A German product introduced in 1937, these flexible all-plastic discs were a European alternative to rigid-based lacquer (acetate) discs. Electrically amplified record players were initially expensive and slow to be adopted. In 1925, the Victor company introduced both the Orthophonic Victrola, an acoustical record player that was designed to play electrically recorded discs, and the electrically amplified Electrola. The acoustical Orthophonics were priced from US$95 to $300, depending on cabinetry. However the cheapest Electrola cost $650, in an era when the price of a new Ford Model T was less than $300 and clerical jobs paid around $20 a week. The audience broke into applause ... John Philip Sousa [said]: '[Gentlemen], that is a band. This is the first time I have ever heard music with any soul to it produced by a mechanical talking machine' ... The new instrument is a feat of mathematics and physics. It is not the result of innumerable experiments, but was worked out on paper in advance of being built in the laboratory ... The new machine has a range of from 100 to 5,000 [cycles], or five and a half octaves ... The 'phonograph tone' is eliminated by the new recording and reproducing process. Sales of records declined precipitously during the Great Depression of the 1930s. RCA, which purchased the Victor Talking Machine Company in 1929, introduced an inexpensive turntable called the Duo Jr., which was designed to be connected to their radio sets. According to Edward Wallerstein (the general manager of RCA's Victor division), this device was "instrumental in revitalizing the industry". The earliest disc records (1889–1894) were made of variety of materials including hard rubber. Around 1895, a shellac-based material was introduced and became standard. Formulas for the mixture varied by manufacturer over time, but it was typically about one-third shellac and two-thirds mineral filler (finely pulverized slate or limestone), with cotton fibers to add tensile strength, carbon black for color (without which it tended to be an unattractive "dirty" gray or brown color), and a very small amount of a lubricant to facilitate release from the manufacturing press. 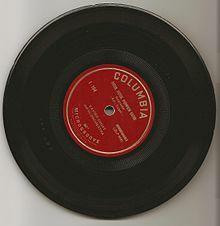 Columbia Records used a laminated disc with a core of coarser material or fiber. The production of shellac records continued throughout the 78 rpm era which lasted until the 1950s in industrialized nations, but well into the 1960s in others. Less abrasive formulations were developed during its waning years and very late examples in like-new condition can have noise levels as low as vinyl. Flexible, "unbreakable" alternatives to shellac were introduced by several manufacturers during the 78 rpm era. Beginning in 1904, Nicole Records of the UK coated celluloid or a similar substance onto a cardboard core disc for a few years, but they were noisy. In the United States, Columbia Records introduced flexible, fiber-cored "Marconi Velvet Tone Record" pressings in 1907, but their longevity and relatively quiet surfaces depended on the use of special gold-plated Marconi Needles and the product was not successful. Thin, flexible plastic records such as the German Phonycord and the British Filmophone and Goodson records appeared around 1930 but not for long. The contemporary French Pathé Cellodiscs, made of a very thin black plastic resembling the vinyl "sound sheet" magazine inserts of the 1965–1985 era, were similarly short-lived. In the US, Hit of the Week records were introduced in early 1930. They were made of a patented translucent plastic called Durium coated on a heavy brown paper base. A new issue debuted weekly, sold at newsstands like a magazine. Although inexpensive and commercially successful at first, they fell victim to the Great Depression and US production ended in 1932. Durium records continued to be made in the UK and as late as 1950 in Italy, where the name "Durium" survived into the LP era as a brand of vinyl records. Despite these innovations, shellac continued to be used for the overwhelming majority of commercial 78 rpm records throughout the format's lifetime. In 1931, RCA Victor introduced vinyl plastic-based Victrolac as a material for unusual-format and special-purpose records. One was a 16-inch, ​33 1⁄3 rpm record used by the Vitaphone sound-on-disc movie system. In 1932, RCA began using Victrolac in a home recording system. By the end of the 1930s vinyl's light weight, strength, and low surface noise had made it the preferred material for prerecorded radio programming and other critical applications. For ordinary 78 rpm records, however, the much higher cost of the synthetic plastic, as well as its vulnerability to the heavy pickups and mass-produced steel needles used in home record players, made its general substitution for shellac impractical at that time. During the Second World War, the United States Armed Forces produced thousands of 12-inch vinyl 78 rpm V-Discs for use by the troops overseas. After the war, the use of vinyl became more practical as new record players with lightweight crystal pickups and precision-ground styli made of sapphire or an exotic osmium alloy proliferated. In late 1945, RCA Victor began offering "De Luxe" transparent red vinyl pressings of some Red Seal classical 78s, at a De luxe price. Later, Decca Records introduced vinyl Deccalite 78s, while other record companies used vinyl formulations trademarked as Metrolite, Merco Plastic, and Sav-o-flex, but these were mainly used to produce "unbreakable" children's records and special thin vinyl DJ pressings for shipment to radio stations. In the 1890s, the diameter of the earliest (toy) discs was generally 12.5 cm (nominally 5 inches). By the mid-1890s, discs were usually 7 inches (nominally 17.5 cm) in diameter. By 1910, the 10-inch (25 cm) record was by far the most popular standard, containing about three minutes of music or other entertainment on one side. From 1903 onwards, 12-inch (30 cm) records were produced, mostly featuring classical music or operatic selections, with four to five minutes of music per side. Victor, Brunswick and Columbia also issued 12-inch popular medleys, usually spotlighting a Broadway show score. An 8-inch (20 cm) disc with a 2-inch (50 mm)-diameter label became popular for about a decade[when?] in Britain, but those records cannot be played in full on most modern record players, because tonearms cannot track far enough toward the center of the record without modifying the equipment. In 1903, Victor offered a series of 14-inch (36 cm) "Deluxe Special" records, which played at 60 rpm and sold for two dollars. Fewer than fifty titles were issued, and the series was dropped in 1906, due to poor sales. Also in 1906, a short-lived British firm called Neophone marketed a series of single-sided 20-inch (50 cm) records, offering complete performances of some operatic overtures and shorter pieces. Pathé also issued 14-inch and 20-inch records around the same time. The playing time of a phonograph record depends on the available groove length divided by the turntable speed. Total groove length in turn depends on how closely the grooves are spaced, in addition to the record diameter. At the beginning of the 20th century, the early discs played for two minutes, the same as cylinder records. The 12-inch disc, introduced by Victor in 1903, increased the playing time to three and a half minutes. Because the standard 10-inch 78 rpm record could hold about three minutes of sound per side, most popular recordings were limited to that duration. For example, when King Oliver's Creole Jazz Band, including Louis Armstrong on his first recordings, recorded 13 sides at Gennett Records in Richmond, Indiana, in 1923, one side was 2:09 and four sides were 2:52–2:59. In January 1938, Milt Gabler started recording for Commodore Records, and to allow for longer continuous performances, he recorded some 12-inch discs. Eddie Condon explained: "Gabler realized that a jam session needs room for development." The first two 12-inch recordings did not take advantage of their capability: "Carnegie Drag" was 3m 15s; "Carnegie Jump", 2m 41s. But at the second session, on April 30, the two 12-inch recordings were longer: "Embraceable You" was 4m 05s; "Serenade to a Shylock", 4m 32s. Another way to overcome the time limitation was to issue a selection extending to both sides of a single record. Vaudeville stars Gallagher and Shean recorded "Mr. Gallagher and Mr. Shean", written by themselves or, allegedly, by Bryan Foy, as two sides of a 10-inch 78 in 1922 for Victor. Longer musical pieces were released as a set of records. In 1903 HMV in England made the first complete recording of an opera, Verdi's Ernani, on 40 single-sided discs. In 1940, Commodore released Eddie Condon and his Band's recording of "A Good Man Is Hard to Find" in four parts, issued on both sides of two 12-inch 78s. The limited duration of recordings persisted from their advent until the introduction of the LP record in 1948. In popular music, the time limit of ​3 1⁄2 minutes on a 10-inch 78 rpm record meant that singers seldom recorded long pieces. One exception is Frank Sinatra's recording of Rodgers and Hammerstein's "Soliloquy", from Carousel, made on May 28, 1946. Because it ran 7m 57s, longer than both sides of a standard 78 rpm 10-inch record, it was released on Columbia's Masterwork label (the classical division) as two sides of a 12-inch record. The same was true of John Raitt's performance of the song on the original cast album of Carousel, which had been issued on a 78-rpm album set by American Decca in 1945. In the 78 era, classical-music and spoken-word items generally were released on the longer 12-inch 78s, about 4–5 minutes per side. For example, on June 10, 1924, four months after the February 12 premier of Rhapsody in Blue, George Gershwin recorded an abridged version of the seventeen-minute work with Paul Whiteman and His Orchestra. It was released on two sides of Victor 55225 and ran for 8m 59s. 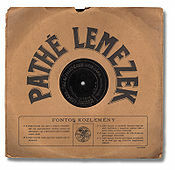 78 rpm records were normally sold individually in brown paper or cardboard sleeves that were plain, or sometimes printed to show the producer or the retailer's name. Generally the sleeves had a circular cut-out exposing the record label to view. Records could be laid on a shelf horizontally or stood on an edge, but because of their fragility, breakage was common. German record company Odeon pioneered the album in 1909 when it released the Nutcracker Suite by Tchaikovsky on 4 double-sided discs in a specially designed package. However, the previous year Deutsche Grammophon had produced an album for its complete recording of the opera Carmen. The practice of issuing albums was not adopted by other record companies for many years. One exception, HMV, produced an album with a pictorial cover for its 1917 recording of The Mikado (Gilbert & Sullivan). By about 1910,[note 1] bound collections of empty sleeves with a paperboard or leather cover, similar to a photograph album, were sold as record albums that customers could use to store their records (the term "record album" was printed on some covers). These albums came in both 10-inch and 12-inch sizes. The covers of these bound books were wider and taller than the records inside, allowing the record album to be placed on a shelf upright, like a book, suspending the fragile records above the shelf and protecting them. In the 1930s, record companies began issuing collections of 78 rpm records by one performer or of one type of music in specially assembled albums, typically with artwork on the front cover and liner notes on the back or inside cover. Most albums included three or four records, with two sides each, making six or eight tunes per album. When the 12-inch vinyl LP era began in 1948, each disc could hold a similar number of tunes as a typical album of 78s, so they were still referred to as an "album", as they are today. For collectible or nostalgia purposes, or for the benefit of higher-quality audio playback provided by the 78 rpm speed with newer vinyl records and their lightweight stylus pickups, a small number of 78 rpm records have been released since the major labels ceased production. One attempt at this was in 1951, when inventor Ewing Dunbar Nunn founded the label Audiophile Records, which released a series of 78 rpm-mastered albums that were microgroove and pressed on vinyl (as opposed to traditional 78s, with their shellac composition and wider 3-mil sized grooves). This series came in heavy manilla envelopes and began with a jazz album AP-1 and was soon followed by other AP numbers up through about AP-19. Around 1953 the standard LP had proven itself to Nunn and he switched to ​33 1⁄3 rpm and began using art slicks on a more standard cardboard sleeve. The Audiophile numbers can be found into the hundreds today but the most collectable ones are the early 78 rpm releases, especially the first, AP-1. The 78 rpm speed was mainly to take advantage of the wider audio frequency response that faster speeds like 78 rpm can provide for vinyl microgroove records, hence the label's name (obviously catering to the audiophiles of the 1950s "hi-fi" era, when stereo gear could provide a much wider range of audio than before). Also around 1953, Bell Records released a series of budget-priced plastic 7-inch 78 rpm pop music singles. In 1968, Reprise planned to release a series of 78 rpm singles from their artists on their label at the time, called the Reprise Speed Series. Only one disc actually saw release, Randy Newman's "I Think It's Going to Rain Today", a track from his self-titled debut album (with "The Beehive State" on the flipside). Reprise did not proceed further with the series due to a lack of sales for the single, and a lack of general interest in the concept. In 1978, guitarist and vocalist Leon Redbone released a promotional 78 rpm record featuring two songs ("Alabama Jubilee" and "Please Don't Talk About Me When I'm Gone") from his Champagne Charlie album. In 1980, Stiff Records in the United Kingdom issued a 78 by Joe "King" Carrasco containing the songs "Buena" (Spanish for "good," with the alternate spelling "Bueno" on the label) and "Tuff Enuff". Underground comic cartoonist and 78 rpm record collector Robert Crumb released three vinyl 78s by his Cheap Suit Serenaders in the 1970s. In the 1990s Rhino Records issued a series of boxed sets of 78 rpm reissues of early rock and roll hits, intended for owners of vintage jukeboxes. The records were made of vinyl, however, and some of the earlier vintage 78 rpm jukeboxes and record players (the ones that were pre-war) were designed with heavy tone arms to play the hard slate-impregnated shellac records of their time. These vinyl Rhino 78's were softer and would be destroyed by old juke boxes and old record players, but play very well on newer 78-capable turntables with modern lightweight tone arms and jewel needles. As a special release for Record Store Day 2011, Capitol re-released The Beach Boys single "Good Vibrations" in the form of a 10-inch 78 rpm record (b/w "Heroes and Villains"). More recently, The Reverend Peyton's Big Damn Band has released their tribute to blues guitarist Charley Patton Peyton on Patton on both 12-inch LP and 10-inch 78 rpm. Both are accompanied with a link to a digital download of the music, acknowledging the probability that purchasers might be unable to play the vinyl recording. A 12-inch LP being played. The stylus is in contact with the surface. Grooves on a modern 33 rpm record. Both the microgroove LP ​33 1⁄3 rpm record and the 45 rpm single records are made from vinyl plastic that is flexible and unbreakable in normal use, even when they are sent through the mail with care from one place to another. The vinyl records, however, are easier to scratch or gouge, and much more prone to warping compared to most 78 rpm records, which were made of shellac. In 1931, RCA Victor launched the first commercially available vinyl long-playing record, marketed as program-transcription discs. These revolutionary discs were designed for playback at ​33 1⁄3 rpm and pressed on a 30 cm diameter flexible plastic disc, with a duration of about ten minutes playing time per side. RCA Victor's early introduction of a long-play disc was a commercial failure for several reasons including the lack of affordable, reliable consumer playback equipment and consumer wariness during the Great Depression. Because of financial hardships that plagued the recording industry during that period (and RCA's own parched revenues), Victor's long-playing records were discontinued by early 1933. There was also a small batch of longer-playing records issued in the very early 1930s: Columbia introduced 10-inch longer-playing records (18000-D series), as well as a series of double-grooved or longer-playing 10-inch records on their Harmony, Clarion & Velvet Tone "budget" labels. There were also a couple of longer-playing records issued on ARC (for release on their Banner, Perfect, and Oriole labels) and on the Crown label. All of these were phased out in mid-1932. Vinyl's lower surface noise level than shellac was not forgotten, nor was its durability. In the late 1930s, radio commercials and pre-recorded radio programs being sent to disc jockeys started being pressed in vinyl, so they would not break in the mail. In the mid-1940s, special DJ copies of records started being made of vinyl also, for the same reason. These were all 78 rpm. During and after World War II, when shellac supplies were extremely limited, some 78 rpm records were pressed in vinyl instead of shellac, particularly the six-minute 12-inch (30 cm) 78 rpm records produced by V-Disc for distribution to United States troops in World War II. In the 1940s, radio transcriptions, which were usually on 16-inch records, but sometimes 12-inch, were always made of vinyl, but cut at ​33 1⁄3 rpm. Shorter transcriptions were often cut at 78 rpm. Beginning in 1939, Dr. Peter Goldmark and his staff at Columbia Records and at CBS Laboratories undertook efforts to address problems of recording and playing back narrow grooves and developing an inexpensive, reliable consumer playback system. It took about eight years of study, except when it was suspended because of World War II. Finally, the 12-inch (30 cm) Long Play (LP) ​33 1⁄3 rpm microgroove record album was introduced by the Columbia Record Company at a New York press conference on June 18, 1948. At the same time, Columbia introduced a vinyl 7-inch ​33 1⁄3 rpm microgroove single, calling it ZLP, but it was short-lived and is very rare today, because RCA Victor introduced a 45 rpm single a few months later, which became the standard. Boston Pops conductor Arthur Fiedler demonstrating the new RCA Victor 45 rpm player and record in February 1949. Unwilling to accept and license Columbia's system, in February 1949, RCA Victor released the first 45 rpm single, 7 inches in diameter with a large center hole. The 45 rpm player included a changing mechanism that allowed multiple disks to be stacked, much as a conventional changer handled 78s. The short playing time of a single 45 rpm side meant that long works, such as symphonies, had to be released on multiple 45s instead of a single LP, but RCA claimed that the new high-speed changer rendered side breaks so brief as to be inaudible or inconsequential. Early 45 rpm records were made from either vinyl or polystyrene. They had a playing time of eight minutes. Another size and format was that of radio transcription discs beginning in the 1940s. These records were usually vinyl, 33 rpm, and 16 inches in diameter. No home record player could accommodate such large records, and they were used mainly by radio stations. They were on average 15 minutes per side and contained several songs or radio program material. These records became less common in the United States when tape recorders began being used for radio transcriptions around 1949. In the UK, analog discs continued to be the preferred medium for the licence of BBC transcriptions to overseas broadcasters until the use of CDs became a practical alternative. On a few early phonograph systems and radio transcription discs, as well as some entire albums, the direction of the groove is reversed, beginning near the center of the disc and leading to the outside. A small number of records (such as The Monty Python Matching Tie and Handkerchief) were manufactured with multiple separate grooves to differentiate the tracks (usually called "NSC-X2"). Edison Records Diamond Disc label, early 1920s. Edison Disc Records always ran at 80 rpm. The earliest rotation speeds varied considerably, but from 1900-1925 most records were recorded at 74–82 revolutions per minute (rpm). Edison Disc Records consistently ran at 80 rpm. At least one attempt to lengthen playing time was made in the early 1920s. World Records produced records that played at a constant linear velocity, controlled by Noel Pemberton Billing's patented add-on speed governor. As the needle moved from the outside to the inside, the rotational speed of the record gradually increased as the groove diameter decreased. This behavior is similar to the modern compact disc and the CLV version of its predecessor, the (analog encoded) Philips LaserDisc, but is reversed from inside to outside,. In 1925, 78.26 rpm was standardized when the 60 Hz AC synchronous motor was introduced to power turntables. The motor ran at 3600 rpm, so that a 46:1 gear ratio would produce 78.26 rpm. In regions of the world that use 50 Hz current, the standard was 77.92 rpm (3,000 rpm with a 77:2 ratio). At that speed, a strobe disc with 77 lines would "stand still" in 50 Hz light (92 lines for 60 Hz). After World War II, these records became retroactively known as 78s, to distinguish them from the newer disc record formats known by their rotational speeds. Earlier they were just called records, or when there was a need to distinguish them from cylinders, disc records. Columbia and RCA Victor's competition extended to equipment. Some turntables included spindle size adapters, but other turntables required snap-in inserts like this one to adapt Victor's larger 45 rpm spindle size to the smaller spindle size available on nearly all turntables. Shown is one popular design in use for many years. 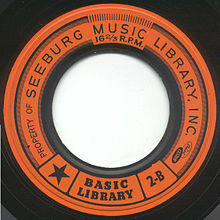 The older 78 rpm format continued to be mass-produced alongside the newer formats using new materials in decreasing numbers until around 1960 in the U.S., and in a few countries, such as the Philippines and India (both countries issued recordings by The Beatles on 78s), into the late 1960s. For example, Columbia Records' last reissue of Frank Sinatra songs on 78 rpm records was an album called Young at Heart, issued in November, 1954. As late as the early 1970s, some children's records were released at the 78 rpm speed. In the United Kingdom, the 78 rpm single persisted somewhat longer than in the United States, where it was overtaken in popularity by the 45 rpm in the late 1950s, as teenagers became increasingly affluent. Some of Elvis Presley's early singles on Sun Records may have sold more copies on 78 than on 45. This is because of their popularity in 1954–55 in "hillbilly" market in the South and Southwestern United States, where replacing the family 78 rpm record player with a new 45 rpm player was a luxury few could afford at the time. By the end of 1957, RCA Victor announced that 78s accounted for less than 10% of Presley's singles sales, confirming the demise of the 78 rpm format. The last Presley single released on 78 in the United States was RCA Victor 20-7410, "I Got Stung"/"One Night" (1958), while the last 78 in the UK was RCA 1194, "A Mess Of Blues"/"Girl Of My Best Friend" issued in 1960. After World War II, two new competing formats entered the market, gradually replacing the standard 78 rpm: the ​33 1⁄3 rpm (often called 33 rpm), and the 45 rpm. The ​33 1⁄3 rpm LP (for "long-play") format was developed by Columbia Records and marketed in June 1948. The first LP release consisted of 85 12-inch classical pieces starting with the Mendelssohn violin concerto, Nathan Milstein violinist, Philharmonic Symphony of New York conducted by Bruno Walter, Columbia ML-4001. Also released in June 1948 were three series of 10-inch "LPs" and a 7-inch "ZLP". RCA Victor developed the 45 rpm format and marketed it in March 1949. The 45s released by RCA in March 1949 were in seven different colors of vinyl depending on the type of music recorded: blues, country, popular, etc. Columbia and RCA Victor each pursued their R&D secretly. Both types of new disc used narrower grooves, intended to be played with a smaller stylus—typically 0.001 inches ("1 mil", 25 µm) wide, compared to 0.003 inches (76 µm) for a 78—so the new records were sometimes described as microgroove. In the mid-1950s all record companies agreed to a common frequency response standard, called RIAA equalization. Prior to the establishment of the standard each company used its own preferred equalization, requiring discriminating listeners to use pre-amplifiers with selectable equalization curves. Some recordings, such as books for the blind, were pressed for playing at ​16 2⁄3 rpm. Prestige Records released jazz records in this format in the late 1950s; for example, two of their Miles Davis albums were paired together in this format. Peter Goldmark, the man who developed the ​33 1⁄3 rpm record, developed the Highway Hi-Fi ​16 2⁄3 rpm record to be played in Chrysler automobiles, but poor performance of the system and weak implementation by Chrysler and Columbia led to the demise of the ​16 2⁄3 rpm records. Subsequently, the ​16 2⁄3 rpm speed was used for narrated publications for the blind and visually impaired, and was never widely commercially available, although it was common to see new turntable models with a 16 rpm speed setting produced as late as the 1970s. The Seeburg Corporation introduced the Seeburg Background Music System in 1959, using a ​16 2⁄3 rpm 9-inch record with 2-inch center hole. Each record held 40 minutes of music per side, recorded at 420 grooves per inch. The commercial rivalry between RCA Victor and Columbia Records led to RCA Victor's introduction of what it had intended to be a competing vinyl format, the 7-inch (175 mm) 45 rpm disc, with a much larger center hole. For a two-year period from 1948 to 1950, record companies and consumers faced uncertainty over which of these formats would ultimately prevail in what was known as the "War of the Speeds". (See also format war.) In 1949 Capitol and Decca adopted the new LP format and RCA Victor gave in and issued its first LP in January 1950. The 45 rpm size was gaining in popularity, too, and Columbia issued its first 45s in February 1951. By 1954, 200 million 45s had been sold. Eventually the 12-inch (300 mm) ​33 1⁄3 rpm LP prevailed as the dominant format for musical albums, and 10-inch LPs were no longer issued. The last Columbia Records reissue of any Frank Sinatra songs on a 10-inch LP record was an album called Hall of Fame, CL 2600, issued on October 26, 1956, containing six songs, one each by Tony Bennett, Rosemary Clooney, Johnnie Ray, Frank Sinatra, Doris Day, and Frankie Laine. The 10-inch LP had a longer life in the United Kingdom, where important early British rock and roll albums such as Lonnie Donegan's Lonnie Donegan Showcase and Billy Fury's The Sound of Fury were released in that form. The 7-inch (175 mm) 45 rpm disc or "single" established a significant niche for shorter duration discs, typically containing one item on each side. The 45 rpm discs typically emulated the playing time of the former 78 rpm discs, while the 12-inch LP discs eventually provided up to one half-hour of recorded material per side. The 45 rpm discs also came in a variety known as extended play (EP), which achieved up to 10–15 minutes play at the expense of attenuating (and possibly compressing) the sound to reduce the width required by the groove. EP discs were cheaper to produce, and were used in cases where unit sales were likely to be more limited or to reissue LP albums on the smaller format for those people who had only 45 rpm players. LP albums could be purchased one EP at a time, with four items per EP, or in a boxed set with three EPs or twelve items. The large center hole on 45s allows for easier handling by jukebox mechanisms. EPs were generally discontinued by the late 1950s in the U.S. as three- and four-speed record players replaced the individual 45 players. One indication of the decline of the 45 rpm EP is that the last Columbia Records reissue of Frank Sinatra songs on 45 rpm EP records, called Frank Sinatra (Columbia B-2641) was issued on December 7, 1959. The EP lasted considerably longer in Europe, and was a popular format during the 1960s for recordings by artists such as Serge Gainsbourg and the Beatles. In the late 1940s and early 1950s, 45 rpm-only players that lacked speakers and plugged into a jack on the back of a radio were widely available. Eventually, they were replaced by the three–speed record player. From the mid-1950s through the 1960s, in the U.S. the common home record player or "stereo" (after the introduction of stereo recording) would typically have had these features: a three- or four-speed player (78, 45, ​33 1⁄3, and sometimes ​16 2⁄3 rpm); with changer, a tall spindle that would hold several records and automatically drop a new record on top of the previous one when it had finished playing, a combination cartridge with both 78 and microgroove styli and a way to flip between the two; and some kind of adapter for playing the 45s with their larger center hole. The adapter could be a small solid circle that fit onto the bottom of the spindle (meaning only one 45 could be played at a time) or a larger adaptor that fit over the entire spindle, permitting a stack of 45s to be played. 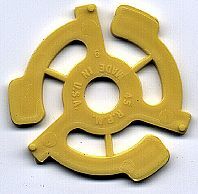 RCA Victor 45s were also adapted to the smaller spindle of an LP player with a plastic snap-in insert known as a "spider". These inserts, commissioned by RCA president David Sarnoff and invented by Thomas Hutchison, were prevalent starting in the 1960s, selling in the tens of millions per year during the 45 rpm heyday. In countries outside the U.S., 45s often had the smaller album-sized holes, e.g., Australia and New Zealand, or as in the United Kingdom, especially before the 1970s, the disc had a small hole within a circular central section held only by three or four lands so that it could be easily punched out if desired (typically for use in jukeboxes). During the vinyl era, various developments were made or introduced. Stereo finally lost its previous experimental status, and eventually became standard internationally. Quadraphonic sound effectively had to wait for digital formats before finding a permanent position in the market place. The term "high fidelity" was coined in the 1920s by some manufacturers of radio receivers and phonographs to differentiate their better-sounding products claimed as providing "perfect" sound reproduction. The term began to be used by some audio engineers and consumers through the 1930s and 1940s. After 1949 a variety of improvements in recording and playback technologies, especially stereo recordings, which became widely available in 1958, gave a boost to the "hi-fi" classification of products, leading to sales of individual components for the home such as amplifiers, loudspeakers, phonographs, and tape players. High Fidelity and Audio were two magazines that hi-fi consumers and engineers could read for reviews of playback equipment and recordings. Stereophonic sound recording, which attempts to provide a more natural listening experience by reproducing the spatial locations of sound sources in the horizontal plane, was the natural extension to monophonic recording, and attracted various alternative engineering attempts. The ultimately dominant "45/45" stereophonic record system was invented by Alan Blumlein of EMI in 1931 and patented the same year. EMI cut the first stereo test discs using the system in 1933 (see Bell Labs Stereo Experiments of 1933) although the system was not exploited commercially until much later. In this system, each of two stereo channels is carried independently by a separate groove wall, each wall face moving at 45 degrees to the plane of the record surface (hence the system's name) in correspondence with the signal level of that channel. By convention, the inner wall carries the left-hand channel and the outer wall carries the right-hand channel. While the stylus only moves horizontally when reproducing a monophonic disk recording, on stereo records the stylus moves vertically as well as horizontally. 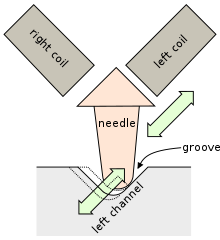 During playback, the movement of a single stylus tracking the groove is sensed independently, e.g., by two coils, each mounted diagonally opposite the relevant groove wall. The combined stylus motion can be represented in terms of the vector sum and difference of the two stereo channels. Vertical stylus motion then carries the L − R difference signal and horizontal stylus motion carries the L + R summed signal, the latter representing the monophonic component of the signal in exactly the same manner as a purely monophonic record. higher fidelity in general, because the "difference" signal is usually of low amplitude and is thus less affected by the greater intrinsic distortion of vertical recording. In 1957 the first commercial stereo two-channel records were issued first by Audio Fidelity followed by a translucent blue vinyl on Bel Canto Records, the first of which was a multi-colored-vinyl sampler featuring A Stereo Tour of Los Angeles narrated by Jack Wagner on one side, and a collection of tracks from various Bel Canto albums on the back. Following in 1958, more stereo LP releases were offered by Audio Fidelity Records in the US and Pye Records in Britain. However, it was not until the mid-to-late 1960s that the sales of stereophonic LPs overtook those of their monophonic equivalents, and became the dominant record type. The development of quadraphonic records was announced in 1971. These recorded four separate sound signals. This was achieved on the two stereo channels by electronic matrixing, where the additional channels were combined into the main signal. When the records were played, phase-detection circuits in the amplifiers were able to decode the signals into four separate channels. There were two main systems of matrixed quadraphonic records produced, confusingly named SQ (by CBS) and QS (by Sansui). They proved commercially unsuccessful, but were an important precursor to later surround sound systems, as seen in SACD and home cinema today. Under the direction of recording engineer C. Robert Fine, Mercury Records initiated a minimalist single microphone monaural recording technique in 1951. The first record, a Chicago Symphony Orchestra performance of Pictures at an Exhibition, conducted by Rafael Kubelik, was described as "being in the living presence of the orchestra" by The New York Times music critic. The series of records was then named Mercury Living Presence. In 1955, Mercury began three-channel stereo recordings, still based on the principle of the single microphone. The center (single) microphone was of paramount importance, with the two side mics adding depth and space. Record masters were cut directly from a three-track to two-track mixdown console, with all editing of the master tapes done on the original three-tracks. In 1961, Mercury enhanced this technique with three-microphone stereo recordings using 35 mm magnetic film instead of ​1⁄2-inch tape for recording. The greater thickness and width of 35 mm magnetic film prevented tape layer print-through and pre-echo and gained extended frequency range and transient response. The Mercury Living Presence recordings were remastered to CD in the 1990s by the original producer, Wilma Cozart Fine, using the same method of three-to-two mix directly to the master recorder. Through the 1960s, 1970s, and 1980s, various methods to improve the dynamic range of mass-produced records involved highly advanced disc cutting equipment. These techniques, marketed, to name two, as the CBS DisComputer and Teldec Direct Metal Mastering, were used to reduce inner-groove distortion. RCA Victor introduced another system to reduce dynamic range and achieve a groove with less surface noise under the commercial name of Dynagroove. Two main elements were combined: another disk material with less surface noise in the groove and dynamic compression for masking background noise. Sometimes this was called "diaphragming" the source material and not favoured by some music lovers for its unnatural side effects. Both elements were reflected in the brandname of Dynagroove, described elsewhere in more detail. It also used the earlier advanced method of forward-looking control on groove spacing with respect to volume of sound and position on the disk. Lower recorded volume used closer spacing; higher recorded volume used wider spacing, especially with lower frequencies. Also, the higher track density at lower volumes enabled disk recordings to end farther away from the disk center than usual, helping to reduce endtrack distortion even further. Also in the late 1970s, "direct-to-disc" records were produced, aimed at an audiophile niche market. These completely bypassed the use of magnetic tape in favor of a "purist" transcription directly to the master lacquer disc. Also during this period, half-speed mastered and "original master" records were released, using expensive state-of-the-art technology. A further late 1970s development was the Disco Eye-Cued system used mainly on Motown 12-inch singles released between 1978 and 1980. 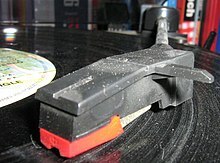 The introduction, drum-breaks, or choruses of a track were indicated by widely separated grooves, giving a visual cue to DJs mixing the records. The appearance of these records is similar to an LP, but they only contain one track each side. The mid-1970s saw the introduction of dbx-encoded records, again for the audiophile niche market. These were completely incompatible with standard record playback preamplifiers, relying on the dbx compandor encoding/decoding scheme to greatly increase dynamic range (dbx encoded disks were recorded with the dynamic range compressed by a factor of two: quiet sounds were meant to be played back at low gain and loud sounds were meant to be played back at high gain, via automatic gain control in the playback equipment; this reduced the effect of surface noise on quiet passages). A similar and very short-lived scheme involved using the CBS-developed "CX" noise reduction encoding/decoding scheme. ELPJ, a Japanese-based company, sells a laser turntable that uses a laser to read vinyl discs optically, without physical contact. The laser turntable eliminates record wear and the possibility of accidental scratches, which degrade the sound, but its expense limits use primarily to digital archiving of analog records, and the laser does not play back colored vinyl or picture discs. Various other laser-based turntables were tried during the 1990s, but while a laser reads the groove very accurately, since it does not touch the record, the dust that vinyl attracts due to static electric charge is not mechanically pushed out of the groove, worsening sound quality in casual use compared to conventional stylus playback. In some ways similar to the laser turntable is the IRENE scanning machine for disc records, which images with microphotography in two dimensions, invented by a team of physicists at Lawrence Berkeley Laboratories. IRENE will retrieve the information from a laterally modulated monaural grooved sound source without touching the medium itself, but cannot read vertically modulated information. This excludes grooved recordings such as cylinders and some radio transcriptions that feature a hill-and-dale format of recording, and stereophonic or quadraphonic grooved recordings, which use a combination of the two as well as supersonic encoding for quadraphonic. An offshoot of IRENE, the Confocal Microscope Cylinder Project, can capture a high-resolution three-dimensional image of the surface, down to 200 µm. In order to convert to a digital sound file, this is then played by a version of the same 'virtual stylus' program developed by the research team in real-time, converted to digital and, if desired, processed through sound-restoration programs. The protective cover of the one-off Voyager Golden Record, containing symbolic information on how it is to be played on the top-left of the label. As recording technology evolved, more specific terms for various types of phonograph records were used in order to describe some aspect of the record: either its correct rotational speed ("​16 2⁄3 rpm" (revolutions per minute), "​33 1⁄3 rpm", "45 rpm", "78 rpm") or the material used (particularly "vinyl" to refer to records made of polyvinyl chloride, or the earlier "shellac records" generally the main ingredient in 78s). Terms such as "long-play" (LP) and "extended-play" (EP) describe multi-track records that play much longer than the single-item-per-side records, which typically do not go much past four minutes per side. An LP can play for up to 30 minutes per side, though most played for about 22 minutes per side, bringing the total playing time of a typical LP recording to about forty-five minutes. Many pre-1952 LPs, however, played for about 15 minutes per side. The 7-inch 45 rpm format normally contains one item per side but a 7-inch EP could achieve recording times of 10 to 15 minutes at the expense of attenuating and compressing the sound to reduce the width required by the groove. EP discs were generally used to make available tracks not on singles including tracks on LPs albums in a smaller, less expensive format for those who had only 45 rpm players. The large center hole on 7-inch 45 rpm records allows for easier handling by jukebox mechanisms. The term "album", originally used to mean a "book" with liner notes, holding several 78 rpm records each in its own "page" or sleeve, no longer has any relation to the physical format: a single LP record, or nowadays more typically a compact disc. The usual diameters of the holes are 0.286 inches (7.26 mm) with larger holes on singles in the USA being 1.5 inches (38.1 mm). Sizes of records in the United States and the UK are generally measured in inches, e.g. 7-inch records, which are generally 45 rpm records. LPs were 10-inch records at first, but soon the 12-inch size became by far the most common. Generally, 78s were 10-inch, but 12-inch and 7-inch and even smaller were made —— the so-called "little wonders". A standard wide-hole 7-inch vinyl record from 1978 on its sleeve. Single 78 rpm 4-5 min/side. 10 in (25 cm) 9-7/8" ±1/32" LP (Long Play) ​33 1⁄3 rpm 12-15 min/side. Before the mid-1950s the ​33 1⁄3 rpm LP was most commonly found in a 10-inch (25 cm) format. The 10-inch format disappeared from United States stores around 1957, supplanted by 12" discs, but remained common in some markets until the mid-1960s. 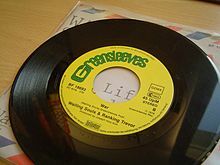 The 10-inch vinyl format was resurrected in the 1970s for marketing some popular recordings as collectible, and these are occasionally seen today. The first disk recordings were invented by Emile Berliner and were pressed as 7 inch approx. 78 rpm recordings between 1887 and 1900. They are rarely found today. The EP Extended Play ​33 1⁄3 rpm 7" disc, which typically contained 2 selections (tracks) on each side, was incompatible with existing juke boxes and unsuccessful when introduced in the U.S. in the 1960s, but was common in Europe and other parts of the world. Original hole diameters were 0.286" ±0.001" for ​33 1⁄3 and 78.26 rpm records, and 1.504" ±0.002" for 45 rpm records. Flexi discs were thin flexible records that were distributed with magazines and as promotional gifts from the 1960s to the 1980s. In March 1949, as RCA released the 45, Columbia released several hundred 7-inch ​33 1⁄3 rpm small spindle hole singles. This format was soon dropped as it became clear that the RCA 45 was the single of choice and the Columbia 12-inch LP would be the "album" of choice. The first release of the 45 came in seven colors: black 47-xxxx popular series, yellow 47-xxxx juvenile series, green (teal) 48-xxxx country series, deep red 49-xxxx classical series, bright red (cerise) 50-xxxx blues/spiritual series, light blue 51-xxxx international series, dark blue 52-xxxx light classics. All colors were soon dropped in favor of black because of production problems. However, yellow and deep red were continued until about 1952. The first 45 rpm record created for sale was "PeeWee the Piccolo" RCA 47-0147 pressed in yellow translucent vinyl at the Sherman Avenue plant, Indianapolis on December 7, 1948, by R. O. Price, plant manager. In the 1970s, the government of Bhutan produced now-collectible postage stamps on playable vinyl mini-discs. The normal commercial disc is engraved with two sound-bearing concentric spiral grooves, one on each side, running from the outside edge towards the center. The last part of the spiral meets an earlier part to form a circle. The sound is encoded by fine variations in the edges of the groove that cause a stylus (needle) placed in it to vibrate at acoustic frequencies when the disc is rotated at the correct speed. Generally, the outer and inner parts of the groove bear no intended sound (exceptions include the Beatles' Sgt. Pepper's Lonely Hearts Club Band and Split Enz's Mental Notes). Increasingly from the early 20th century, and almost exclusively since the 1920s, both sides of the record have been used to carry the grooves. Occasional records have been issued since then with a recording on only one side. In the 1980s Columbia records briefly issued a series of less expensive one-sided 45 rpm singles. The majority of non-78 rpm records are pressed on black vinyl. The coloring material used to blacken the transparent PVC plastic mix is carbon black, which increases the strength of the disc and makes it opaque. Polystyrene is often used for 7-inch records. Some records are pressed on colored vinyl or with paper pictures embedded in them ("picture discs"). Certain 45 rpm RCA or RCA Victor Red Seal records used red translucent vinyl for extra "Red Seal" effect. During the 1980s there was a trend for releasing singles on colored vinyl—sometimes with large inserts that could be used as posters. This trend has been revived recently with 7-inch singles. Since its inception in 1948, vinyl record standards for the United States follow the guidelines of the Recording Industry Association of America (RIAA). 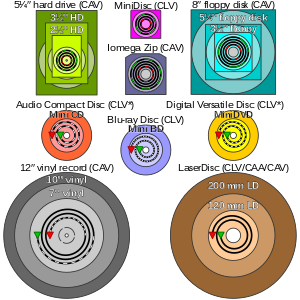 The inch dimensions are nominal, not precise diameters. The actual dimension of a 12-inch record is 302 mm (11.89 in), for a 10-inch it is 250 mm (9.84 in), and for a 7-inch it is 175 mm (6.89 in). Records made in other countries are standardized by different organizations, but are very similar in size. The record diameters are typically nominally 300 mm, 250 mm and 175 mm. There is an area about 3 mm (0.12 in) wide at the outer edge of the disk, called the lead-in or run-in, where the groove is widely spaced and silent. The stylus is lowered onto the lead-in, without damaging the recorded section of the groove. Between tracks on the recorded section of an LP record there is usually a short gap of around 1 mm (0.04 in) where the groove is widely spaced. This space is clearly visible, making it easy to find a particular track. A macro photo of the innermost part of the groove of a vinyl record. Stored sound in the form of variations in the track is visible, as is dust on the record. Towards the center, at the end of the groove, there is another wide-pitched section known as the lead-out. At the very end of this section the groove joins itself to form a complete circle, called the lock groove; when the stylus reaches this point, it circles repeatedly until lifted from the record. On some recordings (for example Sgt. Pepper's Lonely Hearts Club Band by The Beatles, Super Trouper by ABBA and Atom Heart Mother by Pink Floyd), the sound continues on the lock groove, which gives a strange repeating effect. Automatic turntables rely on the position or angular velocity of the arm, as it reaches the wider spacing in the groove, to trigger a mechanism that lifts the arm off the record. Precisely because of this mechanism, most automatic turntables are incapable of playing any audio in the lock groove, since they will lift the arm before it reaches that groove. The catalog number and stamper ID is written or stamped in the space between the groove in the lead-out on the master disc, resulting in visible recessed writing on the final version of a record. Sometimes the cutting engineer might add handwritten comments or their signature, if they are particularly pleased with the quality of the cut. These are generally referred to as "run-out etchings". When auto-changing turntables were commonplace, records were typically pressed with a raised (or ridged) outer edge and a raised label area, allowing records to be stacked onto each other without the delicate grooves coming into contact, reducing the risk of damage. Auto-changers included a mechanism to support a stack of several records above the turntable itself, dropping them one at a time onto the active turntable to be played in order. Many longer sound recordings, such as complete operas, were interleaved across several 10-inch or 12-inch discs for use with auto-changing mechanisms, so that the first disk of a three-disk recording would carry sides 1 and 6 of the program, while the second disk would carry sides 2 and 5, and the third, sides 3 and 4, allowing sides 1, 2, and 3 to be played automatically; then the whole stack reversed to play sides 4, 5, and 6. The sound quality and durability of vinyl records is highly dependent on the quality of the vinyl. During the early 1970s, as a cost-cutting move, much of the industry began reducing the thickness and quality of vinyl used in mass-market manufacturing. The technique was marketed by RCA Victor as the Dynaflex (125 g) process, but was considered inferior by most record collectors. Most vinyl records are pressed from a mix of 70% virgin and 30% recycled vinyl. New or "virgin" heavy/heavyweight (180–220 g) vinyl is commonly used for modern audiophile vinyl releases in all genres. Many collectors prefer to have heavyweight vinyl albums, which have been reported to have better sound than normal vinyl because of their higher tolerance against deformation caused by normal play. 180 g vinyl is more expensive to produce only because it uses more vinyl. Manufacturing processes are identical regardless of weight. In fact, pressing lightweight records requires more care. An exception is the propensity of 200 g pressings to be slightly more prone to non-fill, when the vinyl biscuit does not sufficiently fill a deep groove during pressing (percussion or vocal amplitude changes are the usual locations of these artifacts). This flaw causes a grinding or scratching sound at the non-fill point. Since most vinyl records contain up to 30% recycled vinyl, impurities can accumulate in the record and cause even a brand-new record to have audio artifacts such as clicks and pops. Virgin vinyl means that the album is not from recycled plastic, and will theoretically be devoid of these impurities. In practice, this depends on the manufacturer's quality control. The "orange peel" effect on vinyl records is caused by worn molds. Rather than having the proper mirror-like finish, the surface of the record will have a texture that looks like orange peel. This introduces noise into the record, particularly in the lower frequency range. With direct metal mastering (DMM), the master disc is cut on a copper-coated disc, which can also have a minor "orange peel" effect on the disc itself. As this "orange peel" originates in the master rather than being introduced in the pressing stage, there is no ill effect as there is no physical distortion of the groove. Original master discs are created by lathe-cutting: a lathe is used to cut a modulated groove into a blank record. The blank records for cutting used to be cooked up, as needed, by the cutting engineer, using what Robert K. Morrison describes as a "metallic soap", containing lead litharge, ozokerite, barium sulfate, montan wax, stearin and paraffin, among other ingredients. Cut "wax" sound discs would be placed in a vacuum chamber and gold-sputtered to make them electrically conductive for use as mandrels in an electroforming bath, where pressing stamper parts were made. Later, the French company Pyral invented a ready-made blank disc having a thin nitro-cellulose lacquer coating (approximately 7 mils thickness on both sides) that was applied to an aluminum substrate. Lacquer cuts result in an immediately playable, or processable, master record. If vinyl pressings are wanted, the still-unplayed sound disc is used as a mandrel for electroforming nickel records that are used for manufacturing pressing stampers. The electroformed nickel records are mechanically separated from their respective mandrels. This is done with relative ease because no actual "plating" of the mandrel occurs in the type of electrodeposition known as electroforming, unlike with electroplating, in which the adhesion of the new phase of metal is chemical and relatively permanent. The one-molecule-thick coating of silver (that was sprayed onto the processed lacquer sound disc in order to make its surface electrically conductive) reverse-plates onto the nickel record's face. This negative impression disc (having ridges in place of grooves) is known as a nickel master, "matrix" or "father". The "father" is then used as a mandrel to electroform a positive disc known as a "mother". Many mothers can be grown on a single "father" before ridges deteriorate beyond effective use. The "mothers" are then used as mandrels for electroforming more negative discs known as "sons". Each "mother" can be used to make many "sons" before deteriorating. The "sons" are then converted into "stampers" by center-punching a spindle hole (which was lost from the lacquer sound disc during initial electroforming of the "father"), and by custom-forming the target pressing profile. This allows them to be placed in the dies of the target (make and model) record press and, by center-roughing, to facilitate the adhesion of the label, which gets stuck onto the vinyl pressing without any glue. In this way, several million vinyl discs can be produced from a single lacquer sound disc. When only a few hundred discs are required, instead of electroforming a "son" (for each side), the "father" is removed of its silver and converted into a stamper. Production by this latter method, known as the "two-step process" (as it does not entail creation of "sons" but does involve creation of "mothers", which are used for test playing and kept as "safeties" for electroforming future "sons") is limited to a few hundred vinyl pressings. The pressing count can increase if the stamper holds out and the quality of the vinyl is high. The "sons" made during a "three-step" electroforming make better stampers since they don't require silver removal (which reduces some high fidelity because of etching erasing part of the smallest groove modulations) and also because they have a stronger metal structure than "fathers". Shellac 78s are fragile, and must be handled carefully. In the event of a 78 breaking, the pieces might remain loosely connected by the label and still be playable if the label holds them together, although there is a loud pop with each pass over the crack, and breaking of the stylus is likely. Breakage was very common in the shellac era. In the 1934 John O'Hara novel, Appointment in Samarra, the protagonist "broke one of his most favorites, Whiteman's Lady of the Evening ... He wanted to cry but could not." A poignant moment in J. D. Salinger's 1951 novel The Catcher in the Rye occurs after the adolescent protagonist buys a record for his younger sister but drops it and "it broke into pieces ... I damn-near cried, it made me feel so terrible." A sequence where a school teacher's collection of 78 rpm jazz records is smashed by a group of rebellious students is a key moment in the film Blackboard Jungle. Another problem with shellac was that the size of the disks tended to be larger because it was limited to 80–100 groove walls per inch before the risk of groove collapse became too high, whereas vinyl could have up to 260 groove walls per inch. By the time World War II began, major labels were experimenting with laminated records. As stated above, and in several record advertisements of the period, the materials that make for a quiet surface (shellac) are notoriously weak and fragile. Conversely the materials that make for a strong disc (cardboard and other fiber products) are not those known for allowing a quiet noise-free surface. "Broken record" redirects here. For other uses, see Broken Record (disambiguation). Vinyl records do not break easily, but the soft material is easily scratched. Vinyl readily acquires a static charge, attracting dust that is difficult to remove completely. Dust and scratches cause audio clicks and pops. In extreme cases, they can cause the needle to skip over a series of grooves, or worse yet, cause the needle to skip backwards, creating a "locked groove" that repeats over and over. This is the origin of the phrase "like a broken record" or "like a scratched record", which is often used to describe a person or thing that continually repeats itself. Locked grooves are not uncommon and were even heard occasionally in radio broadcasts. 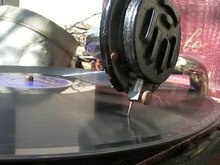 A dusty/scratched vinyl record being played. The dust settles into the grooves. Vinyl records can be warped by heat, improper storage, exposure to sunlight, or manufacturing defects such as excessively tight plastic shrinkwrap on the album cover. A small degree of warp was common, and allowing for it was part of the art of turntable and tonearm design. "Wow" (once-per-revolution pitch variation) could result from warp, or from a spindle hole that was not precisely centered. Standard practice for LPs was to place the LP in a paper or plastic inner cover. This, if placed within the outer cardboard cover so that the opening was entirely within the outer cover, was said to reduce ingress of dust onto the record surface. Singles, with rare exceptions, had simple paper covers with no inner cover. A further limitation of the gramophone record is that fidelity steadily declines as playback progresses; there is more vinyl per second available for fine reproduction of high frequencies at the large-diameter beginning of the groove than exist at the smaller-diameters close to the end of the side. At the start of a groove on an LP there are 510 mm of vinyl per second traveling past the stylus while the ending of the groove gives 200–210 mm of vinyl per second — less than half the linear resolution. Distortion towards the end of the side is likely to become more apparent as record wear increases. Another problem arises because of the geometry of the tonearm. Master recordings are cut on a recording lathe where a sapphire stylus moves radially across the blank, suspended on a straight track and driven by a lead screw. Most turntables use a pivoting tonearm, introducing side forces and pitch and azimuth errors, and thus distortion in the playback signal. Various mechanisms were devised in attempts to compensate, with varying degrees of success. See more at phonograph. There is controversy about the relative quality of CD sound and LP sound when the latter is heard under the very best conditions (see Analog vs. Digital sound argument). It is notable, however, that one technical advantage with vinyl compared to the optical CD is that if correctly handled and stored, the vinyl record will be playable for centuries, which is longer than some versions of the optical CD. In 1925, electric recording extended the recorded frequency range from acoustic recording (168–2,000 Hz) by ​2 1⁄2 octaves to 100–5,000 Hz. Even so, these early electronically recorded records used the exponential-horn phonograph (see Orthophonic Victrola) for reproduction. CD-4 LPs contain two sub-carriers, one in the left groove wall and one in the right groove wall. These sub-carriers use special FM-PM-SSBFM (Frequency Modulation-Phase Modulation-Single Sideband Frequency Modulation) and have signal frequencies that extend to 45 kHz. CD-4 sub-carriers could be played with any type stylus as long as the pickup cartridge had CD-4 frequency response. The recommended stylus for CD-4 as well as regular stereo records was a line contact or Shibata type. 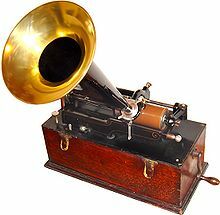 Gramophone sound includes rumble, which is low-frequency (below about 30 Hz) mechanical noise generated by the motor bearings and picked up by the stylus. Equipment of modest quality is relatively unaffected by these issues, as the amplifier and speaker will not reproduce such low frequencies, but high-fidelity turntable assemblies need careful design to minimize audible rumble. Room vibrations will also be picked up if the connections from the pedestal to/from turntable to the pickup arm are not well isolated. Tonearm skating forces and other perturbations are also picked up by the stylus. This is a form of frequency multiplexing as the control signal (restoring force) used to keep the stylus in the groove is carried by the same mechanism as the sound itself. Subsonic frequencies below about 20 Hz in the audio signal are dominated by tracking effects, which is one form of unwanted rumble ("tracking noise") and merges with audible frequencies in the deep bass range up to about 100 Hz. High fidelity sound equipment can reproduce tracking noise and rumble. During a quiet passage, woofer speaker cones can sometimes be seen to vibrate with the subsonic tracking of the stylus, at frequencies as low as just above 0.5 Hz (the frequency at which a ​33 1⁄3 rpm record turns on the turntable; ​5⁄9 Hz exactly on an ideal turntable). Another reason for very low frequency material can be a warped disk: its undulations produce frequencies of only a few hertz and present day amplifiers have large power bandwidths. For this reason, many stereo receivers contained a switchable subsonic filter. Some subsonic content is directly out of phase in each channel. If played back on a mono subwoofer system, the noise will cancel, significantly reducing the amount of rumble that is reproduced. High frequency hiss is generated as the stylus rubs against the vinyl, and dirt and dust on the vinyl produces popping and ticking sounds. The latter can be reduced somewhat by cleaning the record prior to playback. Due to recording mastering and manufacturing limitations, both high and low frequencies were removed from the first recorded signals by various formulae. With low frequencies, the stylus must swing a long way from side to side, requiring the groove to be wide, taking up more space and limiting the playing time of the record. At high frequencies, hiss, pops, and ticks are significant. These problems can be reduced by using equalization to an agreed standard. During recording the amplitude of low frequencies is reduced, thus reducing the groove width required, and the amplitude at high frequencies is increased. The playback equipment boosts bass and cuts treble so as to restore the tonal balance in the original signal; this also reduces the high frequency noise. Thus more music will fit on the record, and noise is reduced. The current standard is called RIAA equalization. It was agreed upon in 1952 and implemented in the United States in 1955; it was not widely used in other countries until the 1970s. Prior to that, especially from 1940, some 100 different formulae were used by the record manufacturers. In 1926 Joseph P. Maxwell and Henry C. Harrison from Bell Telephone Laboratories disclosed that the recording pattern of the Western Electric "rubber line" magnetic disc cutter had a constant velocity characteristic. This meant that as frequency increased in the treble, recording amplitude decreased. Conversely, in the bass as frequency decreased, recording amplitude increased. Therefore, it was necessary to attenuate the bass frequencies below about 250 Hz, the bass turnover point, in the amplified microphone signal fed to the recording head. Otherwise, bass modulation became excessive and overcutting took place into the next record groove. When played back electrically with a magnetic pickup having a smooth response in the bass region, a complementary boost in amplitude at the bass turnover point was necessary. G. H. Miller in 1934 reported that when complementary boost at the turnover point was used in radio broadcasts of records, the reproduction was more realistic and many of the musical instruments stood out in their true form. West in 1930 and later P. G. A. H. Voigt (1940) showed that the early Wente-style condenser microphones contributed to a 4 to 6 dB midrange brilliance or pre-emphasis in the recording chain. This meant that the electrical recording characteristics of Western Electric licensees such as Columbia Records and Victor Talking Machine Company in the 1925 era had a higher amplitude in the midrange region. Brilliance such as this compensated for dullness in many early magnetic pickups having drooping midrange and treble response. As a result, this practice was the empirical beginning of using pre-emphasis above 1,000 Hz in 78 rpm and ​33 1⁄3 rpm records. Over the years a variety of record equalization practices emerged and there was no industry standard. For example, in Europe recordings for years required playback with a bass turnover setting of 250–300 Hz and a treble roll-off at 10,000 Hz ranging from 0 to −5 dB or more. In the US there were more varied practices and a tendency to use higher bass turnover frequencies such as 500 Hz as well as a greater treble rolloff like −8.5 dB and even more to record generally higher modulation levels on the record. Evidence from the early technical literature concerning electrical recording suggests that it wasn't until the 1942–1949 period that there were serious efforts to standardize recording characteristics within an industry. Heretofore, electrical recording technology from company to company was considered a proprietary art all the way back to the 1925 Western Electric licensed method used by Columbia and Victor. For example, what Brunswick-Balke-Collender (Brunswick Corporation) did was different from the practices of Victor. Broadcasters were faced with having to adapt daily to the varied recording characteristics of many sources: various makers of "home recordings" readily available to the public, European recordings, lateral-cut transcriptions, and vertical-cut transcriptions. Efforts were started in 1942 to standardize within the National Association of Broadcasters (NAB), later known as the National Association of Radio and Television Broadcasters (NARTB). The NAB, among other items, issued recording standards in 1949 for laterally and vertically cut records, principally transcriptions. 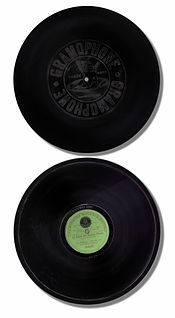 A number of 78 rpm record producers as well as early LP makers also cut their records to the NAB/NARTB lateral standard. The lateral cut NAB curve was remarkably similar to the NBC Orthacoustic curve that evolved from practices within the National Broadcasting Company since the mid-1930s. Empirically, and not by any formula, it was learned that the bass end of the audio spectrum below 100 Hz could be boosted somewhat to override system hum and turntable rumble noises. Likewise at the treble end beginning at 1,000 Hz, if audio frequencies were boosted by 16 dB at 10,000 Hz the delicate sibilant sounds of speech and high overtones of musical instruments could survive the noise level of cellulose acetate, lacquer–aluminum, and vinyl disc media. When the record was played back using a complementary inverse curve, signal-to-noise ratio was improved and the programming sounded more lifelike. When the Columbia LP was released in June 1948, the developers subsequently published technical information about the ​33 1⁄3 rpm microgroove long playing record. Columbia disclosed a recording characteristic showing that it was like the NAB curve in the treble, but had more bass boost or pre-emphasis below 200 Hz. The authors disclosed electrical network characteristics for the Columbia LP curve. This was the first such curve based on formulae. In 1951, at the beginning of the post-World War II high fidelity (hi-fi) popularity, the Audio Engineering Society (AES) developed a standard playback curve. This was intended for use by hi-fi amplifier manufacturers. If records were engineered to sound good on hi-fi amplifiers using the AES curve, this would be a worthy goal towards standardization. This curve was defined by the time constants of audio filters and had a bass turnover of 400 Hz and a 10,000 Hz rolloff of −12 dB. RCA Victor and Columbia were in a market war concerning which recorded format was going to win: the Columbia LP versus the RCA Victor 45 rpm disc (released in February 1949). Besides also being a battle of disc size and record speed, there was a technical difference in the recording characteristics. RCA Victor was using "new orthophonic", whereas Columbia was using the LP curve. Ultimately, the New Orthophonic curve was disclosed in a publication by R.C. Moyer of RCA Victor in 1953. He traced RCA Victor characteristics back to the Western Electric "rubber line" recorder in 1925 up to the early 1950s laying claim to long-held recording practices and reasons for major changes in the intervening years. The RCA Victor New Orthophonic curve was within the tolerances for the NAB/NARTB, Columbia LP, and AES curves. It eventually became the technical predecessor to the RIAA curve. As the RIAA curve was essentially an American standard, it had little impact outside the USA until the late 1970s when European recording labels began to adopt the RIAA equalization. It was even later when some Asian recording labels adopted the RIAA standard. In 1989, many Eastern European recording labels and Russian recording labels such as Melodiya were still using their own CCIR equalization. Hence the RIAA curve did not truly become a global standard until the late 1980s. Further, even after officially agreeing to implement the RIAA equalization curve, many recording labels continued to use their own proprietary equalization even well into the 1970s. Columbia is one such prominent example in the USA, as are Decca, Teldec and Deutsche Grammophon in Europe. Overall sound fidelity of records produced acoustically using horns instead of microphones had a distant, hollow tone quality. Some voices and instruments recorded better than others; Enrico Caruso, a famous tenor, was one popular recording artist of the acoustic era whose voice was well matched to the recording horn. It has been asked, "Did Caruso make the phonograph, or did the phonograph make Caruso?" Delicate sounds and fine overtones were mostly lost, because it took a lot of sound energy to vibrate the recording horn diaphragm and cutting mechanism. There were acoustic limitations due to mechanical resonances in both the recording and playback system. Some pictures of acoustic recording sessions show horns wrapped with tape to help mute these resonances. Even an acoustic recording played back electrically on modern equipment sounds like it was recorded through a horn, notwithstanding a reduction in distortion because of the modern playback. Toward the end of the acoustic era, there were many fine examples of recordings made with horns. Electric recording which developed during the time that early radio was becoming popular (1925) benefited from the microphones and amplifiers used in radio studios. 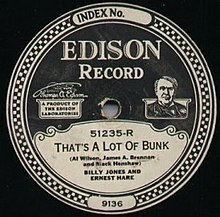 The early electric recordings were reminiscent tonally of acoustic recordings, except there was more recorded bass and treble as well as delicate sounds and overtones cut on the records. This was in spite of some carbon microphones used, which had resonances that colored the recorded tone. The double button carbon microphone with stretched diaphragm was a marked improvement. Alternatively, the Wente style condenser microphone used with the Western Electric licensed recording method had a brilliant midrange and was prone to overloading from sibilants in speech, but generally it gave more accurate reproduction than carbon microphones. It was not unusual for electric recordings to be played back on acoustic phonographs. The Victor Orthophonic phonograph was a prime example where such playback was expected. In the Orthophonic, which benefited from telephone research, the mechanical pickup head was redesigned with lower resonance than the traditional mica type. Also, a folded horn with an exponential taper was constructed inside the cabinet to provide better impedance matching to the air. As a result, playback of an Orthophonic record sounded like it was coming from a radio. Eventually, when it was more common for electric recordings to be played back electrically in the 1930s and 1940s, the overall tone was much like listening to a radio of the era. Magnetic pickups became more common and were better designed as time went on, making it possible to improve the damping of spurious resonances. Crystal pickups were also introduced as lower cost alternatives. The dynamic or moving coil microphone was introduced around 1930 and the velocity or ribbon microphone in 1932. Both of these high quality microphones became widespread in motion picture, radio, recording, and public address applications. Over time, fidelity, dynamic and noise levels improved to the point that it was harder to tell the difference between a live performance in the studio and the recorded version. This was especially true after the invention of the variable reluctance magnetic pickup cartridge by General Electric in the 1940s when high quality cuts were played on well-designed audio systems. The Capehart radio/phonographs of the era with large diameter electrodynamic loudspeakers, though not ideal, demonstrated this quite well with "home recordings" readily available in the music stores for the public to buy. There were important quality advances in recordings specifically made for radio broadcast. In the early 1930s Bell Telephone Laboratories and Western Electric announced the total reinvention of disc recording: the Western Electric Wide Range System, "The New Voice of Action". The intent of the new Western Electric system was to improve the overall quality of disc recording and playback. The recording speed was ​33 1⁄3 rpm, originally used in the Western Electric/ERPI movie audio disc system implemented in the early Warner Brothers' Vitaphone "talkies" of 1927. The newly invented Western Electric moving coil or dynamic microphone was part of the Wide Range System. It had a flatter audio response than the old style Wente condenser type and didn't require electronics installed in the microphone housing. Signals fed to the cutting head were pre-emphasized in the treble region to help override noise in playback. Groove cuts in the vertical plane were employed rather than the usual lateral cuts. The chief advantage claimed was more grooves per inch that could be crowded together, resulting in longer playback time. Additionally, the problem of inner groove distortion, which plagued lateral cuts, could be avoided with the vertical cut system. Wax masters were made by flowing heated wax over a hot metal disc thus avoiding the microscopic irregularities of cast blocks of wax and the necessity of planing and polishing. Vinyl pressings were made with stampers from master cuts that were electroplated in vacuo by means of gold sputtering. Audio response was claimed out to 8,000 Hz, later 13,000 Hz, using light weight pickups employing jeweled styli. Amplifiers and cutters both using negative feedback were employed thereby improving the range of frequencies cut and lowering distortion levels. Radio transcription producers such as World Broadcasting System and Associated Music Publishers (AMP) were the dominant licensees of the Western Electric wide range system and towards the end of the 1930s were responsible for two-thirds of the total radio transcription business. These recordings use a bass turnover of 300 Hz and a 10,000 Hz rolloff of −8.5 dB. Developmentally, much of the technology of the long playing record, successfully released by Columbia in 1948, came from wide range radio transcription practices. 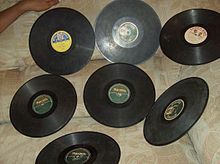 The use of vinyl pressings, increased length of programming, and general improvement in audio quality over 78 rpm records were the major selling points. The complete technical disclosure of the Columbia LP by Peter C. Goldmark, Rene' Snepvangers and William S. Bachman in 1949 made it possible for a great variety of record companies to get into the business of making long playing records. The business grew quickly and interest spread in high fidelity sound and the do-it-yourself market for pickups, turntables, amplifier kits, loudspeaker enclosure plans, and AM/FM radio tuners. The LP record for longer works, 45 rpm for pop music, and FM radio became high fidelity program sources in demand. Radio listeners heard recordings broadcast and this in turn generated more record sales. The industry flourished. Technology used in making recordings also developed and prospered. There were ten major evolutionary steps that improved LP production and quality during a period of approximately forty years. Electrical transcriptions and 78s were first used as sources to master LP lacquer–aluminium cuts in 1948. This was before magnetic tape was commonly employed for mastering. Variable pitch groove spacing helped enable greater recorded dynamic levels. The heated stylus improved the cutting of high frequencies. Gold sputtering in vacuo became increasingly used to make high quality matrices from the cuts to stamp vinyl records. Decca in Britain used high-quality wide range condenser microphones for the Full Frequency Range Recording (FFRR) system c. 1949. Wax mastering was employed to produce Decca/London LPs. This created considerable interest in the United States, and served to raise the customer's overall expectations of quality in microgroove records. Tape recording with condenser microphones became a long used standard operating procedure in mastering lacquer–aluminium cuts. This improved the overall pickup of high quality sound and enabled tape editing. Over the years there were variations in the kinds of tape recorders used, such as the width and number of tracks employed, including 35 mm magnetic film technology. Production of stereo tape masters and the stereo LP in 1958 brought significant improvements in recording technology. Limitations in the disc cutting part of the process later generated the idea that half-speed mastering would improve quality (in which the source tape is played at half-speed and the lacquer–aluminium disc cut at ​16 2⁄3 rpm rather than ​33 1⁄3 rpm). Some 12 inch LPs were cut at 45 rpm claiming better quality sound, but this practice was short-lived. Efforts were made in the 1970s to record as many as four audio channels on an LP (quadraphonic) by means of matrix and modulated carrier methods. This development was neither a widespread success nor long lasting. Efforts were also made to simplify the chain of equipment in the recording process and return to live recording directly to the disc master. Noise reduction systems were also used in tape mastering of some LPs, as well as in the LP itself. As video recorder technology improved it became possible to modify them and use analogue to digital converters (codecs) for digital sound recording. This brought greater dynamic range to tape mastering, combined with low noise and distortion, and freedom from drop outs as well as pre- and post-echo. The digital recording was played back providing a high quality analogue signal to master the lacquer–aluminium cut. The stereo image was not made up of fully discrete Left and Right channels; each channel's signal coming out of the cartridge contained a small amount of the signal from the other channel, with more crosstalk at higher frequencies. High-quality disc cutting equipment was capable of making a master disc with 30–40 dB of stereo separation at 1,000 Hz, but the playback cartridges had lesser performance of about 20 to 30 dB of separation at 1000 Hz, with separation decreasing as frequency increased, such that at 12 kHz the separation was about 10–15 dB. A common modern view is that stereo isolation must be higher than this to achieve a proper stereo soundstage. However, in the 1950s the BBC determined in a series of tests that only 20–25 dB is required for the impression of full stereo separation. Thin, closely spaced spiral grooves that allow for increased playing time on a ​33 1⁄3 rpm microgroove LP lead to a tinny pre-echo warning of upcoming loud sounds. The cutting stylus unavoidably transfers some of the subsequent groove wall's impulse signal into the previous groove wall. It is discernible by some listeners throughout certain recordings, but a quiet passage followed by a loud sound will allow anyone to hear a faint pre-echo of the loud sound occurring 1.8 seconds ahead of time. This problem can also appear as "post"-echo, with a tinny ghost of the sound arriving 1.8 seconds after its main impulse. Factory problems involving incomplete flow of hot vinyl within the stamper can fail to accurately recreate a small section of one side of the groove, a problem called non-fill. It usually appears on the first item on a side if present at all. Non-fill makes itself known as a tearing, grating or ripping sound. A static electric charge can build up on the surface of the spinning record and discharge into the stylus, making a loud "pop". In very dry climates, this can happen several times per minute. Subsequent plays of the same record do not have pops in the same places in the music as the static buildup isn't tied to variations in the groove. An off-center stamping will apply a slow 0.56 Hz modulation to the playback, affecting pitch due to the modulating speed that the groove runs under the stylus. The effect becomes gradually more acute during playback as the stylus moves closer to the center of the record. It also affects tonality because the stylus is pressed alternately against one groove wall and then the other, making the frequency response change in each channel. This problem is often called "wow", though turntable and motor problems can also cause pitch-only "wow". Tracking force of the stylus is not always the same from beginning to end of the groove. Stereo balance can shift as the recording progresses. Outside electrical interference may be amplified by the magnetic cartridge. Common household wallplate SCR dimmers sharing AC lines may put noise into the playback, as can poorly shielded electronics and strong radio transmitters. Loud sounds in the environment may be transmitted mechanically from the turntable's sympathetic vibration into the stylus. Heavy footfalls can bounce the needle out of the groove. Because of a slight slope in the lead-in groove, it is possible for the stylus to skip ahead several grooves when settling into position at the start of the recording. The LP is delicate. Any accidental fumbling with the stylus or dropping of the record onto a sharp corner can scratch the record permanently, creating a series of "ticks" and "pops" heard at each subsequent playback. Heavier accidents can cause the stylus to break through the groove wall as it plays, creating a permanent skip that will cause the stylus to either skip ahead to the next groove or skip back to the previous groove. 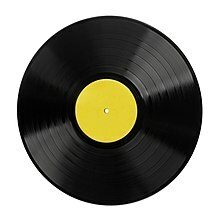 A skip going to the previous groove is called a broken record; the same section of 1.8 seconds of LP (1.3 s of 45 rpm) music will repeat over and over until the stylus is lifted off the record. It is also possible to put a slight pressure on the headshell causing the stylus to stay in the desired groove, without having a playback break. This requires some skill, but is of great use when, for instance, digitizing a recording, as no information is skipped. Audiophiles have differed over the relative merits of the LP versus the CD since the digital disc was introduced. Vinyl records are still prized by some for their reproduction of analog recordings, despite digital being more accurate in reproducing an analog or digital recording. [unreliable source?] The LP's drawbacks, however, include surface noise, less resolution due to a lower Signal to Noise ratio and dynamic range, stereo crosstalk, tracking error, pitch variations and greater sensitivity to handling. Modern anti-aliasing filters and oversampling systems used in digital recordings have eliminated perceived problems observed with very early CD players. There is a theory that vinyl records can audibly represent higher frequencies than compact discs, though most of this is noise and not relevant to human hearing. According to Red Book specifications, the compact disc has a frequency response of 20 Hz up to 22,050 Hz, and most CD players measure flat within a fraction of a decibel from at least 0 Hz to 20 kHz at full output. Due to the distance required between grooves, it is not possible for an LP to reproduce as low frequencies as a CD. Additionally, turntable rumble and acoustic feedback obscures the low-end limit of vinyl but the upper end can be, with some cartridges, reasonably flat within a few decibels to 30 kHz, with gentle roll-off. Carrier signals of Quad LPs popular in the 1970s were at 30 kHz to be out of the range of human hearing. The average human auditory system is sensitive to frequencies from 20 Hz to a maximum of around 20,000 Hz. The upper and lower frequency limits of human hearing vary per person. High frequency sensitivity decreases as a person ages, a process called presbycusis. By contrast, hearing damage from loud noise exposure typically makes it more difficult to hear lower frequencies, such as three kHz through six kHz. For the first several decades of disc record manufacturing, sound was recorded directly on to the "master disc" at the recording studio. From about 1950 on (earlier for some large record companies, later for some small ones) it became usual to have the performance first recorded on audio tape, which could then be processed or edited, and then dubbed on to the master disc. A record cutter would engrave the grooves into the master disc. Early versions of these master discs were soft wax, and later a harder lacquer was used. The mastering process was originally something of an art as the operator had to manually allow for the changes in sound which affected how wide the space for the groove needed to be on each rotation. 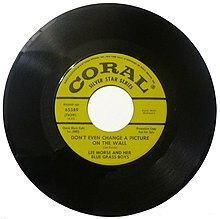 45 rpm records, like this single from 1956, usually had a chosen A-side, for radio promotion as a possible hit, with a flip side or B-side by the same artist – though some had two A-sides. As the playing of gramophone records causes gradual degradation of the recording, they are best preserved by transferring them onto other media and playing the records as rarely as possible. They need to be stored on edge, and do best under environmental conditions that most humans would find comfortable. The equipment for playback of certain formats (e.g. ​16 2⁄3 and 78 rpm) is manufactured only in small quantities, leading to increased difficulty in finding equipment to play the recordings. Where old disc recordings are considered to be of artistic or historic interest, from before the era of tape or where no tape master exists, archivists play back the disc on suitable equipment and record the result, typically onto a digital format, which can be copied and manipulated to remove analog flaws without any further damage to the source recording. For example, Nimbus Records uses a specially built horn record player to transfer 78s. Anyone can do this using a standard record player with a suitable pickup, a phono-preamp (pre-amplifier) and a typical personal computer. However, for accurate transfer, professional archivists carefully choose the correct stylus shape and diameter, tracking weight, equalisation curve and other playback parameters and use high-quality analogue-to-digital converters. As an alternative to playback with a stylus, a recording can be read optically, processed with software that calculates the velocity that the stylus would be moving in the mapped grooves and converted to a digital recording format. This does no further damage to the disc and generally produces a better sound than normal playback. This technique also has the potential to allow for reconstruction of broken or otherwise damaged discs. Groove recordings, first designed in the final quarter of the 19th century, held a predominant position for nearly a century—withstanding competition from reel-to-reel tape, the 8-track cartridge, and the compact cassette. In 1988, the compact disc surpassed the gramophone record in unit sales. Vinyl records experienced a sudden decline in popularity between 1988 and 1991, when the major label distributors restricted their return policies, which retailers had been relying on to maintain and swap out stocks of relatively unpopular titles. First the distributors began charging retailers more for new product if they returned unsold vinyl, and then they stopped providing any credit at all for returns. Retailers, fearing they would be stuck with anything they ordered, only ordered proven, popular titles that they knew would sell, and devoted more shelf space to CDs and cassettes. Record companies also deleted many vinyl titles from production and distribution, further undermining the availability of the format and leading to the closure of pressing plants. This rapid decline in the availability of records accelerated the format's decline in popularity, and is seen by some as a deliberate ploy to make consumers switch to CDs, which unlike today, were more profitable for the record companies. In spite of their flaws, such as the lack of portability, records still have enthusiastic supporters. Vinyl records continue to be manufactured and sold today, especially by independent rock bands and labels, although record sales are considered to be a niche market composed of audiophiles, collectors, and DJs. Old records and out-of-print recordings in particular are in much demand by collectors the world over. (See Record collecting.) Many popular new albums are given releases on vinyl records and older albums are also given reissues, sometimes on audiophile-grade vinyl. In the United Kingdom, the popularity of indie rock caused sales of new vinyl records (particularly 7 inch singles) to increase significantly in 2006, briefly reversing the downward trend seen during the 1990s. In the United States, annual vinyl sales increased by 85.8% between 2006 and 2007, albeit off a low base, and by 89% between 2007 and 2008. However, sales increases have moderated over recent years falling to less than 10% during 2017. Many electronic dance music and hip hop releases today are still preferred on vinyl; however, digital copies are still widely available. This is because for disc jockeys ("DJs"), vinyl has an advantage over the CD: direct manipulation of the medium. DJ techniques such as slip-cueing, beatmatching, and scratching originated on turntables. With CDs or compact audio cassettes one normally has only indirect manipulation options, e.g., the play, stop, and pause buttons. With a record one can place the stylus a few grooves farther in or out, accelerate or decelerate the turntable, or even reverse its direction, provided the stylus, record player, and record itself are built to withstand it. However, many CDJ and DJ advances, such as DJ software and time-encoded vinyl, now have these capabilities and more. Figures released in the United States in early 2009 showed that sales of vinyl albums nearly doubled in 2008, with 1.88 million sold — up from just under 1 million in 2007. In 2009, 3.5 million units sold in the United States, including 3.2 million albums, the highest number since 1998. Sales have continued to rise into the 2010s, with around 2.8 million sold in 2010, which is the most sales since record keeping began in 1991, when vinyl had been overshadowed by Compact Cassettes and compact discs. In 2014 artist Jack White sold 40,000 copies of his second solo release, Lazaretto, on vinyl. The sales of the record beat the largest sales in one week on vinyl since 1991. The sales record was previously held by Pearl Jam's, Vitalogy, which sold 34,000 copies in one week in 1994. In 2014, the sale of vinyl records was the only physical music medium with increasing sales with relation to the previous year. Sales of other mediums including individual digital tracks, digital albums and compact discs have fallen, the latter having the greatest drop-in-sales rate. In 2011, the Entertainment Retailers Association in the United Kingdom found that consumers were willing to pay on average £16.30 (€19.37, US$25.81) for a single vinyl record, as opposed to £7.82 (€9.30, US$12.38) for a CD and £6.80 (€8.09, US$10.76) for a digital download. In the United States, new vinyl releases often have a larger profit margin (individual item) than do releases on CD or digital downloads (in many cases), as the latter formats quickly go down in price. In 2015 the sales of vinyl records went up 32%, to $416 million, their highest level since 1988. There were 31.5 million vinyl records sold in 2015, and the number has increased annually ever since 2006. Vinyl sales continued to grow in 2017, comprising 14% of all physical album sales. Number one vinyl LP sold was the re-release of The Beatles’ Sgt. Pepper’s Lonely Hearts Club Band. Australian single figures for 2007, 2008 and 2009 are estimated. In reality German figures are considered to be "a lot higher" due to smaller shops and online communities in Germany not using scanner cash registers. One German record pressing company stated that they alone produce 2 million LPs each year. In reality American figures are considered to be much higher, with one record store owner, in a New York Times article, estimating that Nielson SoundScan only tracks "about 15 percent" of total sales due to bar codes, concluding that sales could now be as high as 20 million. In Sweden, vinyl sales in 2010 were up 92% from 2009 figures, and in 2011 up a further 52% from 2010 figures. In 2012 vinyl sales increased with 59% from 2011 figures. In New Zealand, independent record stores in Auckland were reporting a five-fold increase in vinyl sales from 2007 to 2011. In France, the SNEP said that LP sales were 200,000 in 2008, however independent record labels said that overall sales were probably 1 million. In United States, 67% of all vinyl album sales in 2012 were sold at independent music stores. Vinyl revenues were at the lowest point in its history in 2006, with a total trade value of $36 million. The 2011 figure of $116 million is higher than the 2000 figure of $109 million, but is still less than the 1997, 1998 and 1999 figures, which were all between $150 and $170 million. In June 1991, CBS released the open CX format, downward compatible for higher dynamic range and noise reduction. VinylVideo was a 45 RPM format to store a low resolution black and white video on record. ^ A catalogue issued in 1911 by Barnes & Mullins, musical-instrument dealers of London, illustrates examples in both 10-inch and 12-inch sizes; one is shown containing two records issued by Gramophone & Typewriter Ltd no later than 1908, suggesting that the image is several years old. ^ It's almost final for vinyl: Record manufacturers dwindle in the U.S. Archived 2013-01-16 at the Wayback Machine Kitchener – Waterloo Record – Kitchener, Ont., January 9, 1991. ^ NME.COM. "Millennials push 2015 vinyl sales to 26-year high in US". NME.COM. Archived from the original on 2015-12-26. ^ "Vinyl sales pass 1m for first time this century". Wired UK. Archived from the original on 2016-04-20. ^ The 2 slower speeds used by the Library of Congress to supply the National Library Service for the Blind and Physically Handicapped. ^ Scientific American. (1877). The talking phonograph. Scientific American, 14 December, 384. ^ "Search Method: Retrieve a Single Document or Folder/Volume - The Edison Papers". Edison.rutgers.edu. 2012-02-20. Archived from the original on 2016-04-27. Retrieved 2016-04-10. ^ Wallace, Robert (November 17, 1952). "First It Said 'Mary'". LIFE. Time Inc: 87–102. ^ Ober, Norman (1973). "You Can Thank Emil Berliner for the Shape Your Record Collection Is In". Music Educators Journal, Vol. 60, No. 4 (December, 1973), pp. 38–40. ^ Read, Oliver (1952). "History of Acoustical Recording". The Recording and Reproduction of Sound (revised and enlarged 2nd ed.). Indianapolis: Howard W. Sams. pp. 12, 14, 15. ^ Copeland, Peter (2008). Manual of Analogue Audio Restoration Techniques (PDF). London: British Library. pp. 89–90. Archived (PDF) from the original on 22 December 2015. Retrieved 16 December 2015. ^ Rick Kennedy, Jelly Roll, Bix, and Hoagy: Gennett Studios and the Birth of Recorded Jazz, Bloomington and Indianapolis: Indiana University Press, 1994, pp. 63–64. ^ Jacques Chailley – 40,000 Years of Music: Man in Search of Music – 1964 p. 144 "On March 21st, 1925, Alfred Cortot made for the Victor Gramophone Co., in Camden, New Jersey, the first classical recording to employ a new technique, thanks to which the gramophone was to play an important part in musical life: electric ..."
^ Wanamaker (1926-01-16). Wanamaker's ad in The New York Times, January 16, 1926, p. 16. ^ The New York Times (1925-10-07). "New Music Machine Thrills All Hearers At First Test Here". Archived 2013-05-10 at the Wayback Machine Front page. ^ "LPs historic". Musicinthemail.com. Archived from the original on 2016-04-26. Retrieved 2016-04-10. ^ Millard, Andre (1995). America on Record: A History of Recorded Sound. Cambridge University Press. ISBN 0-521-47556-2. Archived from the original on 2016-05-08 – via Google Books. ^ Welch, Walter L.; Burt, Leah (1994). From Tinfoil to Stereo: The Acoustic Years of the Recording Industry, 1877-1929. University Press of Florida. ISBN 0-8130-1317-8. ^ Allain, Rhett (July 11, 2014). "Why Are Songs on the Radio About the Same Length?". Wired. Archived from the original on July 11, 2014. Retrieved July 11, 2014. ^ "HITS OF THE 1920s, Vol. 2 (1921-1923)". Naxos.com. Archived from the original on 2016-01-25. Retrieved 2016-04-10. ^ "Paul Whiteman and his Orchestra". Redhotjazz.com. Archived from the original on 2012-01-05. Retrieved 2011-12-19. ^ "Billboard". Books.google.com. 1968-05-25. p. 3. Archived from the original on 2016-05-09. Retrieved 2016-04-10. ^ "Billboard". Books.google.com. 1968-11-23. p. 10. Archived from the original on 2016-06-04. Retrieved 2016-04-10. ^ "The Beatles at 78 RPM". Cool78s.com. Archived from the original on 2016-03-04. Retrieved 2016-04-10. ^ "Peyton On Patton | Rev. Peyton's Big Damn Band". Bigdamnband.com. 2011-05-05. Archived from the original on 2011-05-07. Retrieved 2016-04-10. ^ Penndorf, Ron. "Early Development of the LP". Archived from the original on 5 November 2005. Retrieved 4 October 2006. ^ Williams, Trevor I. (1982). A Short History of Twentieth-Century Technology, c.1900-c.1950. Oxford University Press. ISBN 0-19-858159-9. ^ Frank Andrews; Arthur Badrock; Edward S. Walker (1992). World Records, Vocalion "W" Fetherflex and Penny Phono Recordings: A listing. Spalding, Lincolnshire: The Authors. ^ a b c "The 45 Adaptor". ARChive of Contemporary Music, or "Would You Take My Mind Out for a Walk". 2008-03-20. Archived from the original on 2016-03-10. ^ Gorman, Robert (May 1949). "What's what in the platter battle". Popular Science. Bonnier Corporation. 154 (5): 132–133. ISSN 0161-7370. ^ Biro, Nick (July 20, 1959). "Seeburg Background Music Move Part of Diversification Program". Billboard. New York: Billboard Publishing Co. p. 67. ^ "Hometown Has Been Shutdown". Members.aol.com. Archived from the original on 2008-06-30. Retrieved 2012-09-26. ^ Morton, David L., Jr. (2006). Sound recording: the life story of a technology. Greenwood technographies. JHU Press. p. 94. ISBN 0-8018-8398-9. Archived from the original on 2016-05-10. ^ Spanias, Andreas; Painter, Ted; Atti, Venkatraman (2007). Audio signal processing and coding. Wiley-Interscience. p. xv–xvi. ISBN 0-471-79147-4. Archived from the original on 2016-05-11. ^ "Stereo disc recording". Archived from the original on 25 September 2006. Retrieved 4 October 2006. ^ Reed, Peter Hugh (1958). American record guide, p. 205. ^ "Bulletin E 3: Standards for Stereophonic Disc Records". Aardvark Mastering. RIAA. October 16, 1963. Archived from the original on November 15, 2014. Retrieved November 10, 2014. ^ "Little Wonder Records, Bubble Books, Emerson, Victor, Harper, Columbia, Waterson, Berlin and Snyder". Littlewonderrecords.com. Archived from the original on 2016-04-20. Retrieved 2016-04-10. ^ "Supplement No. 2 to NAB (NARTB) Engineering Handbook; NARTB Recording and Reproducing Standards" (PDF). 1953. ^ "The curious tale of Bhutan's playable record postage stamps". The Vinyl Factory. 30 December 2015. Archived from the original on 2 February 2017. ^ Bayly, Ernie (February 1976). "Double-sided records". The Talking Machine Review International. Ernie Bayly, Bournemouth (38): 596–597. ^ "Standards for Stereophonic Disc Records". Record Industry Association of America Inc. 1963-10-16. Archived from the original on 4 October 2006. Retrieved 4 October 2006. ^ "Record Collectors Guild on Dynaflex". The Record Collectors Guild. Archived from the original on 2007-09-28. ^ Fritz, Jose. "180 grams " Archived 2011-07-27 at the Wayback Machine, Arcane Radio Trivia, January 23, 2009. Accessed January 26, 2009. "The basic measurement behind those grams is thickness. It's been said to be less noisy, which really has more to do with the grade of vinyl." ^ Shay Sayre, Cynthia King, Entertainment and Society: Influences, Impacts, and Innovations (2010), p. 558: "The phrase 'sounding like a broken record' has been used to describe a person who says the same thing over and over again; the reference is to old records that would skip and repeat owing to scratch marks on the vinyl." ^ "Comparative tables for 30 cm LP Standards". A.biglobe.ne.jp. Archived from the original on 2012-08-05. Retrieved 2012-09-26. ^ Penndorf, Ronald (1994). Recollections guide to collectible LPs, volume 1, p. 89. Recollections. ^ Alexandrovich, George (1987). "Disc Recording and Playback". In Glen Ballou. Handbook for Sound Engineers: The New Audio Cyclopedia. Howard W. Sams & Company. pp. 873–882, 897. ISBN 0-672-21983-2. ^ Self, Douglas (2002). Small Signal Audio Design. Taylor & Francis. p. 254. ISBN 0240521773. Archived from the original on 2016-06-24. ^ "Audacity Team Forum: Pre-echo when recording vinyl record". Audacityteam.org. Archived from the original on 2009-06-09. Retrieved 2012-09-26. ^ Cutnell, John D.; Johnson, Kenneth W. (1997). Physics. 4th ed. Wiley. p. 466. ISBN 0-471-19112-4. ^ "Sonic Science: The High-Frequency Hearing Test". Archived from the original on 24 October 2017. Retrieved 20 October 2017. ^ "''Guidelines on the Production and Preservation of Digital Audio Objects'' (IASA TC04)". Iasa-web.org. 2012-09-21. Archived from the original on 2015-05-08. Retrieved 2012-09-26. ^ Fadeyev, V.; C. Haber (2003). "Reconstruction of mechanically recorded sound by image processing" (PDF). Journal of the Audio Engineering Society. 51 (December): 1172. Archived (PDF) from the original on 2005-05-25. ^ Sources vary on the actual dates. ^ Browne, David (October 4, 1991). "A Vinyl Farewell". Entertainment Weekly (86). ^ Souvignier, Todd (2004). The World of DJs and the Turntable Culture. Hal Leonard Corporation. pp. 41–42. ISBN 978-0-634-05833-2. ^ Negativland. "Shiny, Aluminum, Plastic, and Digital" – via urbigenous.net. ^ Plasketes, George (1992). "Romancing the Record: The Vinyl De-Evolution and Subcultural Evolution". Journal of Popular Culture. 26 (1): 110,112. doi:10.1111/j.0022-3840.1992.00109.x. ^ "Record Store Day: This is what happens inside a vinyl factory - BBC Newsbeat". Bbc.co.uk. 1970-01-01. Archived from the original on 2016-04-18. Retrieved 2017-01-08. ^ Tony Glover (2006-05-14). "Back in the groove". The Business Online.com. Archived from the original on 31 December 2006. Retrieved 14 January 2007. ^ Chris Hastings (2006-09-17). "Why singles are top of the pops again". London: Telegraph.co.uk. Archived from the original on 14 March 2007. Retrieved 4 October 2006. ^ Browne, David (2009-01-08). "Vinyl Returns in the Age of MP3". Rolling Stone. Archived from the original on 2008-06-04. Retrieved 2008-06-12. ^ Kreps, Daniel (2009-01-08). "Radiohead, Neutral Milk Hotel Help Vinyl Sales Almost Double In 2008". Rolling Stone. Archived from the original on 2009-03-19. Retrieved 2009-03-05. ^ "RIAA Mid-Year 2017 Music Industry Revenue Report". RIAA. 20 September 2017. ^ Zuel, Bernard (January 24, 2009). "Just for the record". The Sydney Morning Herald. Archived from the original on January 27, 2009. Retrieved 2009-02-07. ^ "2009 R.I.A.A. 2009 Year-End Shipment Statistics" (PDF). Archived from the original (PDF) on 2010-06-02. Retrieved 2012-09-26. ^ Kornelis, Chris (2015-01-27). "Do CDs Sound Better Than Vinyl?". L.A. Weekly. Archived from the original on 2016-04-09. Retrieved 2016-04-10. ^ Perpetua, Matthew (January 6, 2011). "Vinyl Sales Increase Despite Industry Slump". Rolling Stone. Archived from the original on January 9, 2011. Retrieved 2011-01-07. ^ a b c "German Biz Eyes Growth In 2011, Hopes To Top U.K." Billboard. 24 March 2010. ^ "Vinyl sales up 55%". Thecmuwebsite.com. Archived from the original on 2016-03-22. Retrieved 2016-04-10. ^ "Vinyl Record Sales At A 28 Year High". Fortune.com. Archived from the original on 2016-12-20. Retrieved 2017-01-08. ^ a b "CD: The indestructible music format that REFUSES TO DIE". Theregister.co.uk. Archived from the original on 2016-03-04. Retrieved 2016-04-10. ^ "ARIA releases 2007 wholesale music sales figures". Aria.com.au. 2008-03-19. Archived from the original on 2017-01-04. Retrieved 2017-01-08. ^ "ARIA Release - 2009 wholesale sales figures_FINAL DRAFT" (PDF). Aria.com.au. Archived (PDF) from the original on 2017-03-09. Retrieved 2017-01-08. ^ "ARIA releases 2010 wholesale sales figures" (PDF). Aria.com.au. Archived (PDF) from the original on 2017-02-22. Retrieved 2017-01-08. ^ a b "ARIA releases wholesale figures for 2011" (PDF). Aria.com.au. Archived (PDF) from the original on 2017-02-15. Retrieved 2017-01-08. ^ "2012 ARIA Yearly Statistics" (PDF). Aria.com.au. Archived (PDF) from the original on 2017-02-17. Retrieved 2017-01-08. ^ "Musikindustrie: Online-Dienste wachsen, CD-Verkauf schrumpft mäßig". heise online. 19 April 2012. Archived from the original on 3 June 2013. ^ "Lothar Scholz : Phonomarkt" (PDF). Miz.org. Archived (PDF) from the original on 2016-06-11. Retrieved 2017-01-08. ^ "CUMULATIVE SALES : January-December 2007" (PDF). Ifpi.fi. Archived (PDF) from the original on 2017-05-16. Retrieved 2017-01-08. ^ "CUMULATIVE SALES : January-December 2008" (PDF). Ifpi.fi. Archived (PDF) from the original on 2016-06-14. Retrieved 2017-01-08. ^ "CUMULATIVE SALES : January-December 2009" (PDF). Ifpi.fi. Archived (PDF) from the original on 2016-06-23. Retrieved 2017-01-08. ^ "CUMULATIVE SALES : January-December 2012" (PDF). Ifpi.fi. Archived (PDF) from the original on 2016-06-23. Retrieved 2017-01-08. ^ "PHYSICAL SALES : January-December 2012" (PDF). Ifpi.fi. Archived (PDF) from the original on 2016-06-17. Retrieved 2017-01-08. ^ "CUMULATIVE SALES : January-December 2011" (PDF). Ifpi.fi. Archived (PDF) from the original on 2016-06-17. Retrieved 2017-01-08. ^ "一般社団法人 日本レコード協会" (PDF). Riaj.or.jp. Archived (PDF) from the original on 2012-10-27. Retrieved 2016-04-10. ^ "Marktinformatie audio 2014 en voorgaande jaren". Nvpi.nl. Archived from the original on 2014-07-17. Retrieved 2016-04-10. ^ a b c d e f "Vinylförsäljningen fortsätter att öka". Svt.se. Archived from the original on 2012-12-23. ^ "Vinyl Sales 2000-2009" (PDF). Bpi.co.uk. Archived (PDF) from the original on 2017-03-12. Retrieved 2017-01-08. ^ a b "2012 Top 10 Selling Vinyl Albums, Vinyl Sales Rise In The U.S. And UK - hypebot". Hypebot.com. Archived from the original on 2016-04-12. Retrieved 2016-04-10. ^ "Radiohead, Neutral Milk Hotel Help Vinyl Sales Almost Double In 2008". Rolling Stone. Archived from the original on 2011-11-02. ^ "Vinyl LP Sales Up 33% In 2009". Sonicstate. Archived from the original on 2013-01-28. ^ "Vinyl Sales in 2010 Increase Despite Music Industry Slump - Rolling Stone". Rolling Stone. Archived from the original on 2011-01-09. ^ "German Biz Eyes Growth In 2011, Hopes To Top U.K." Billboard. 24 March 2010. ^ "Revival on the Black Market: Editorial". Kunstsoffe-international.com. Archived from the original on 2013-05-10. Retrieved 2016-04-10. ^ "Building a House of Wax in Cleveland". The New York Times. 23 October 2011. Archived from the original on 22 June 2017. ^ "U.S. Vinyl Record Sales May Be 6X Higher Than Soundscan Reports". Hypebot.com. Archived from the original on 2016-03-25. Retrieved 2016-04-10. ^ "SoundScan may be under reporting US vinyl sales". Thecmuwebsite.com. Archived from the original on 2016-03-23. Retrieved 2016-04-10. ^ "Musikförsäljningsstatistik". Ifpi.se. Archived from the original on 2016-04-08. Retrieved 2016-04-10. ^ "Increase in vinyl sales helps independent music stores". Newswire.co.nz. Archived from the original on 2016-03-29. Retrieved 2016-04-10. ^ Guillaume Champeau. "Face au CD en déclin, le disque vinyle fait un retour en force". Numerama. Archived from the original on 2013-06-07. ^ "Despite Pandora & Spotify, total U.S. music sales grew in 2012 - VentureBeat - Media - by Tom Cheredar". VentureBeat. Archived from the original on 2017-09-19. Fadeyev, V.; C. Haber (2003). "Reconstruction of mechanically recorded sound by image processing" (PDF). Journal of the Audio Engineering Society. 51 (December): 1172. Lawrence, Harold; "Mercury Living Presence". Compact disc liner notes. Bartók, Antal Dorati, Mercury 432 017-2. 1991.
International standard IEC 60098: Analogue audio disk records and reproducing equipment. Third edition, International Electrotechnical Commission, 1987. College Physics, Sears, Zemansky, Young, 1974, LOC #73-21135, chapter: "Acoustic Phenomena"
Where Have All the Good Times Gone? : The Rise and Fall of the Record Industry Louis Barfe. Pressing the LP Record by Ellingham, Niel, published at 1 Bruach Lane, PH16 5DG, Scotland. Sound Recordings by Peter Copeland published 1991 by the British Library ISBN 0-7123-0225-5. Vinyl: A History of the Analogue Record by Richard Osborne. Ashgate, 2012. ISBN 978-1-4094-4027-7. The manufacturing and production of shellac records. Educational video, 1942. Reproduction of 78 rpm records including equalization data for different makes of 78s and LPs. The Secret Society of Lathe Trolls, a site devoted to all aspects of the making of Gramophone records.